1. A Traveling once around a circular path means that the final position is the same as the initial position. Therefore, the displacement is zero. The average speed, which is total distance traveled divided by elapsed time, cannot be zero. Since the velocity changed (because its direction changed), there was a nonzero acceleration. Therefore, only Statement I is true. Since t is a positive scalar, the direction of ā is the same as the direction of v, which is displayed above; choice (C) is best. 3. C Statement I is false since a projectile experiencing only the constant acceleration due to gravity can travel in a parabolic trajectory. Statement II is true: Zero acceleration means no change in speed (or direction). Statement III is false: An object whose speed remains constant but whose velocity vector is changing direction is accelerating. 4. C The baseball is still under the influence of Earth’s gravity. Its acceleration throughout the entire flight is constant, equal to g downward. Note that the stone’s initial horizontal speed (v0x = 10 m/s) is irrelevant. 8. B First we determine the time required for the ball to reach the top of its parabolic trajectory (which is the time required for the vertical velocity to drop to zero). 9. C After 4 seconds, the stone’s vertical speed has changed by vy = ayt = (10 m/s2)(4 s) = 40 m/s. Since v0y = 0, the value of vy at t = 4 is 40 m/s. The horizontal speed does not change. Therefore, when the rock hits the water, its velocity has a horizontal component of 30 m/s and a vertical component of 40 m/s. 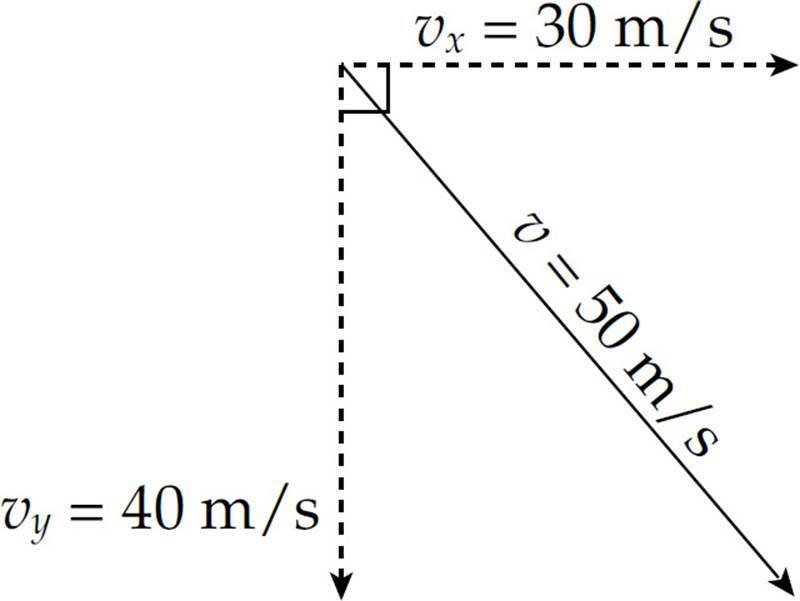 By the Pythagorean theorem, the magnitude of the total velocity, v, is 50 m/s. 10. E Since the acceleration of the projectile is always downward (because it’s gravitational acceleration), the vertical speed decreases as the projectile rises and increases as the projectile falls. Statements (A), (B), (C), and (D) are all false. 11. D The velocity is the derivative of the position function. Take the derivative of x(t) and plug in t = 4 s, to determine the velocity. 12. 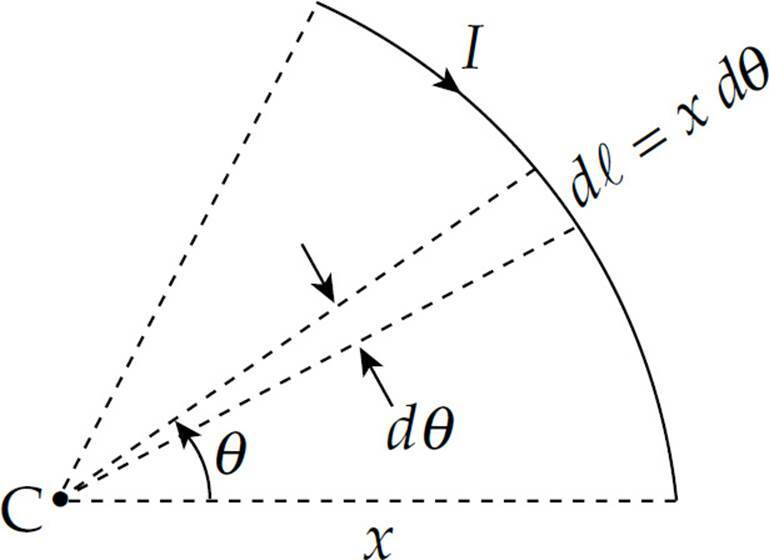 D The displacement of the object is the area between the velocity function and the t-axis. Divide the area up to 3 seconds into one rectangle created for the first second and one triangle for the next two seconds. Remember that the area is the displacement, not the position. Since the object started at x = 3 m, when t = 0 s, it is now 8 meters away from that point. Therefore its position is 11 m.
1. (a) At time t = 1 s, the car’s velocity starts to decrease as the acceleration (which is the slope of the given v vs. t graph) changes from positive to negative. (b) The average velocity between t = 0 and t = 1 s is (vt=0 + vt=1) = (0 + 20 m/s) = 10 m/s, and the average velocity between t = 1 and t = 5 is (vt=1 + vt=5) = (20 m/s + 0) = 10 m/s. The two average velocities are the same. will be maximized when sin 2θ0 is maximized. This occurs when 2θ0 = 90°, that is, when θ0 = 45°. 3. (a) If we need to find how long the cannonball takes to reach the plane of the wall, we are dealing with the horizontal direction. The only equation we need is x = vxt. 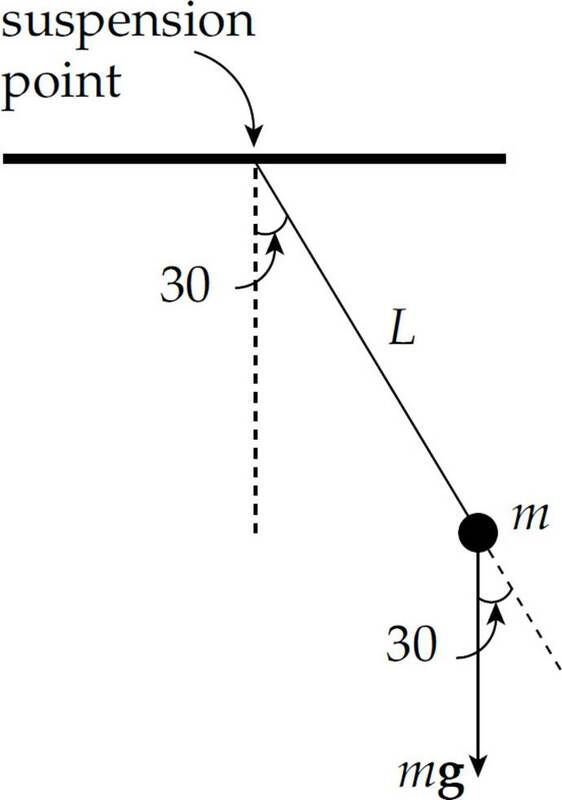 (b) To determine whether the cannonball hits the wall, we need to know the vertical displacement of the ball when it reaches the plane of the wall. Since the wall is 30 m tall, the cannonball strikes the wall 7.2 m below the top of the wall. 1. B Because the person is not accelerating, the net force he feels must be zero. Therefore, the magnitude of the upward normal force from the floor must balance that of the downward gravitational force. Although these two forces have equal magnitudes, they do not form an action/reaction pair because they both act on the same object (namely, the person). The forces in an action/reaction pair always act on different objects. 2. D First draw a free-body diagram. 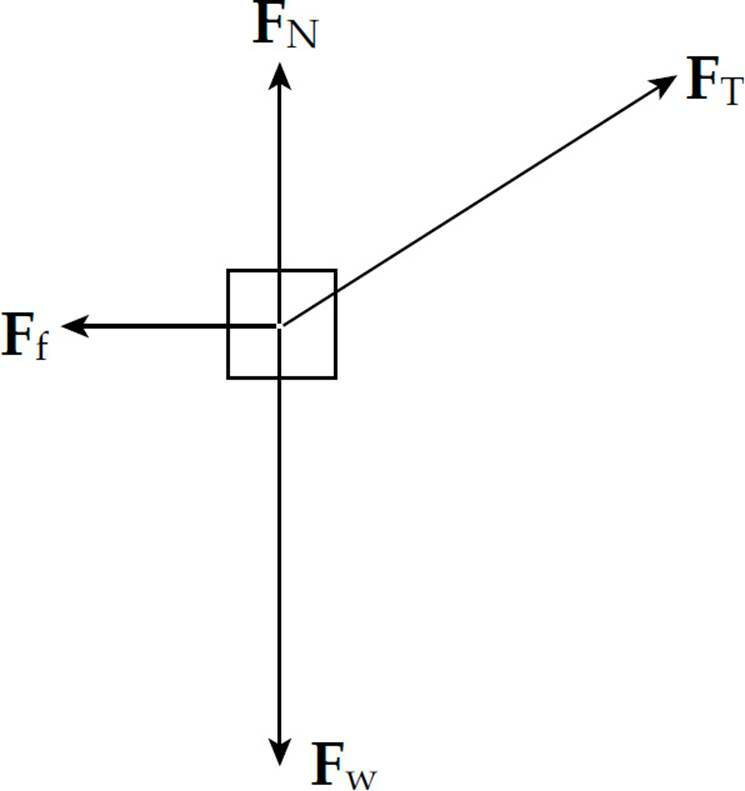 The person exerts a downward force on the scale, and the scale pushes up on the person with an equal (but opposite) force, FN. Thus, the scale reading is FN, the magnitude of the normal force. Since FN – Fw = ma, we have FN = Fw + ma = (800 N) + [800 N/(10 m/s2)](5 m/s2) = 1200 N.
3. 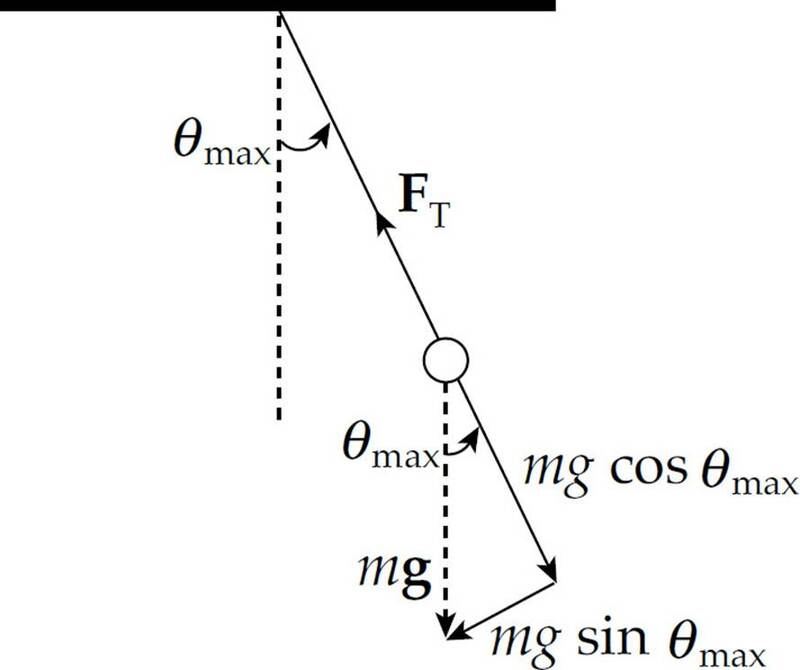 A The net force that the object feels on the inclined plane is mg sin θ, the component of the gravitational force that is parallel to the ramp. Since sin θ = (5 m)/(20 m) = 1/4, we have Fnet = (2 kg)(10 N/kg)(1/4) = 5 N.
4. C The net force on the block is F – Ff = F – µkFN = F – µkFw = (18 N) – (0.4)(20 N) = 10 N. Since Fnet = ma = (Fw/g)a, we find that 10 N = [(20 N)/(10 m/s2)]a, which gives a = 5 m/s2. 7. E If Fnet = 0, then a = 0. No acceleration means constant speed (possibly, but not necessarily, zero) with no change in direction. Therefore, statements B, C, and D are false, and statement A is not necessarily true. 9. 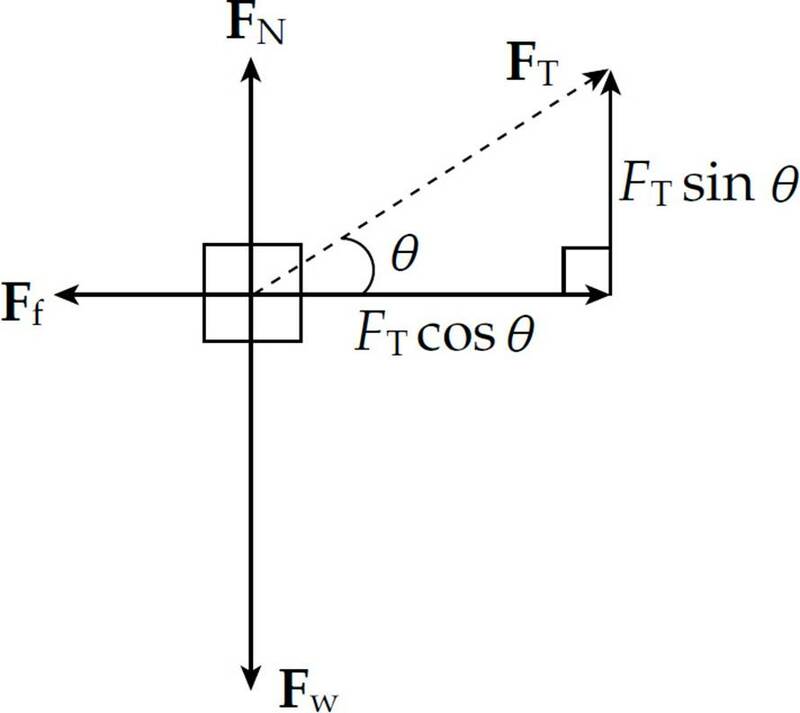 D The maximum force that static friction can exert on the crate is µsFN = µsFw = µsmg = (0.4)(100 kg)(10 N/kg) = 392 N. Since the force applied to the crate is only 344 N, static friction is able to apply that same magnitude of force on the crate, keeping it stationary. 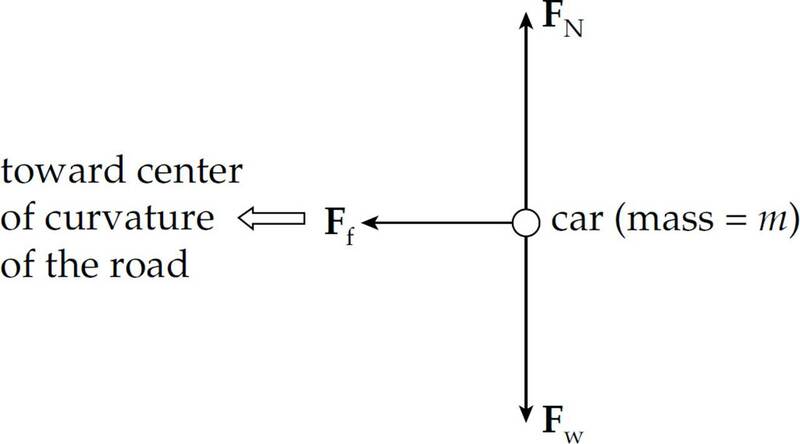 Note that choice (B) is incorrect because the static friction force is not the reaction force to F; both F and Ff (static) act on the same object (the crate) and therefore cannot form an action/reaction pair. 10. 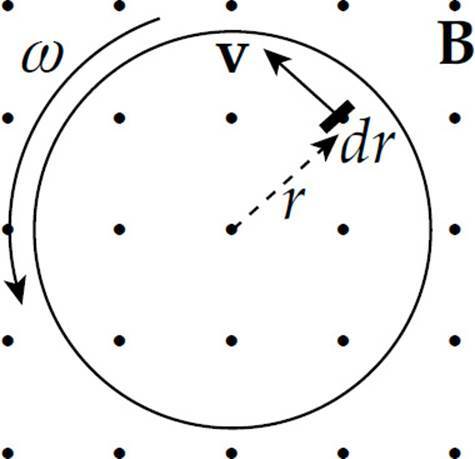 E Neither the velocity nor the acceleration is constant because the direction of each of these vectors is always changing as the object moves along its circular path. And the net force on the object is not zero, because a centripetal force must be acting to provide the necessary centripetal acceleration to maintain the object’s circular motion. Call this f(θ). To determine the value of θ at which f(θ) = cos θ μ sin θ attains an extreme value, we take the derivative of f and set it equal to zero. is greater than f (0) = 1 or f ( π) = µ, the values of f at the endpoints of the interval. 3. (a) First draw free-body diagrams for the two boxes. (i) For a to be positive, we must have m2 – m1 sin θ > 0, which implies that sin θ < m2/m1, or, equivalently, θ < sin–1(m2/m1). (ii) For a to be zero, we must have m2 – m1 sin θ = 0, which implies that sin θ = m2/m1, or, equivalently, θ = sin–1(m2/m1). 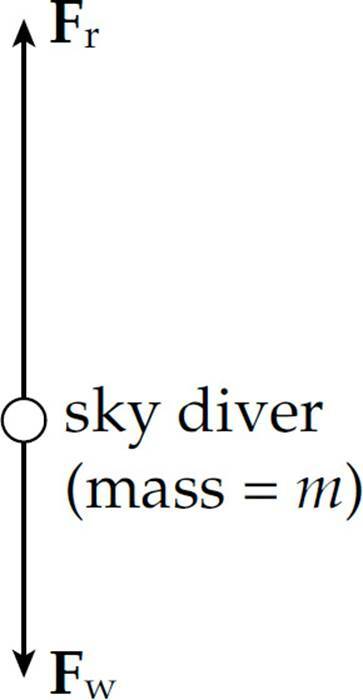 (d) The sky diver’s descent speed is initially v0. However, once the parachute opens, the force of air resistance provides a large, speed-dependent upward acceleration, causing her descent velocity to decrease. 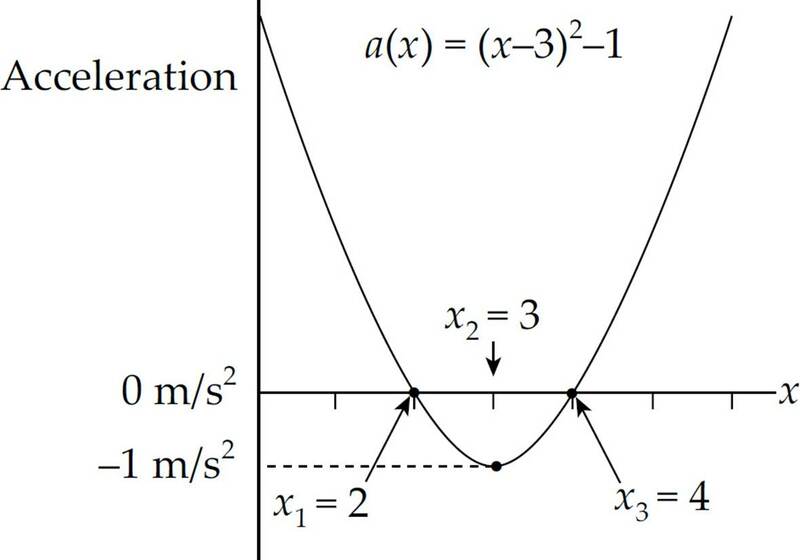 The slope of the v vs. t graph (the acceleration) is not constant but instead decreases to zero as her descent speed decreases from v0 tovt. Therefore, the graph is not linear. 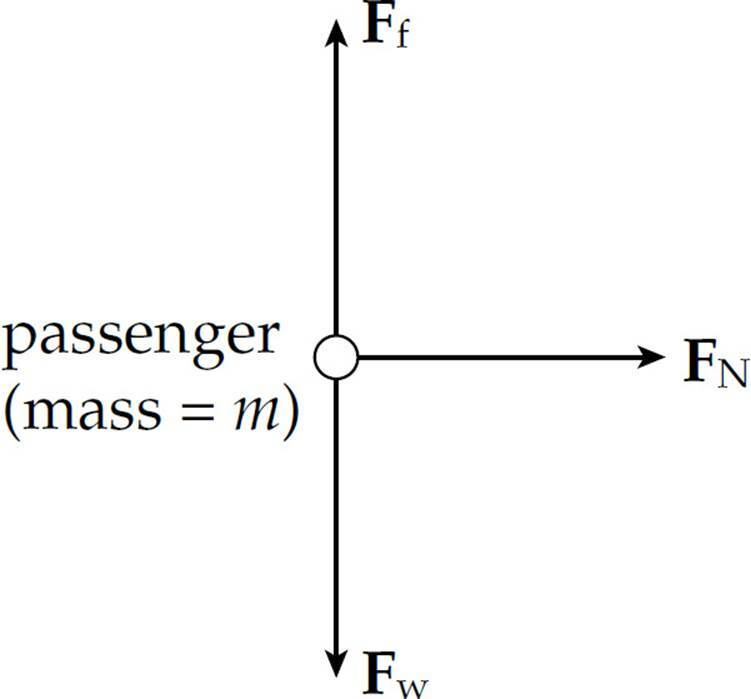 Therefore, the coefficient of static friction between the passenger and the wall of the cylinder must satisfy this condition in order to keep the passenger from sliding down. 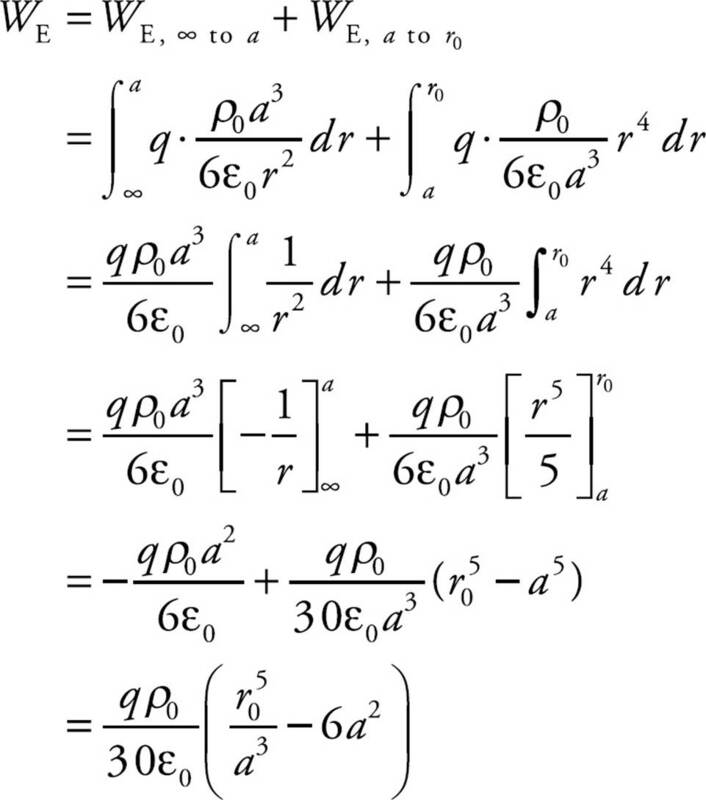 (c) Since the mass m canceled out in deriving the expression for µs, the conditions are independent of mass. 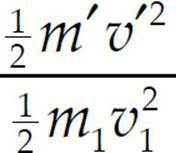 Thus, the inequality µs ≥ gr/v2 holds for both the adult passenger of mass m and the child of mass m/2. 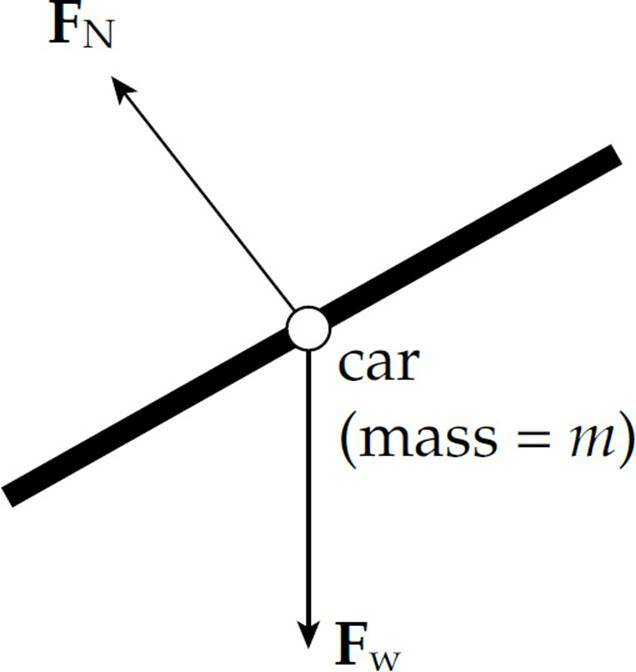 (b) The force of static friction [we assume static friction because we don’t want the car to slide (that is, skid)] provides the necessary centripetal force. 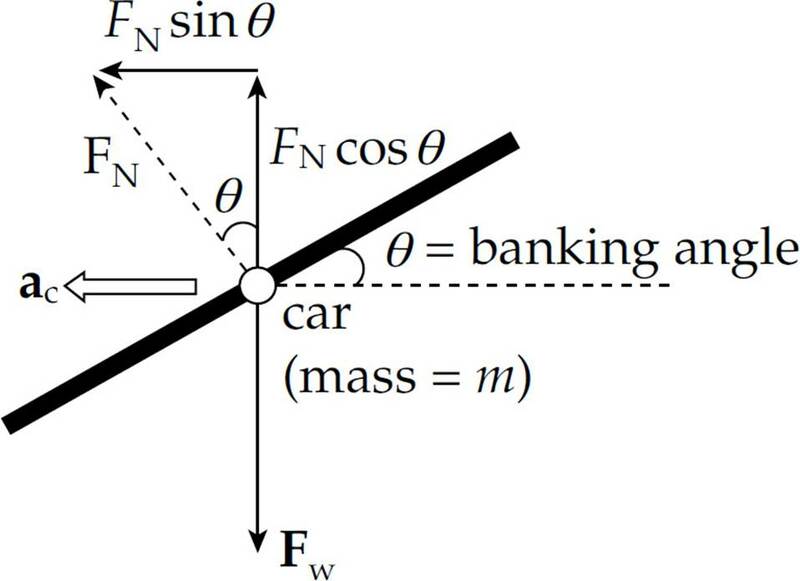 (d) Because of the banking of the turn, the normal force is tilted toward the center of curvature of the road. The component of FN toward the center can provide the centripetal force, making reliance on friction unnecessary. There’s no vertical acceleration, so FN cos θ = Fw = mg = 0, so FN = mg/cos θ. The component of FN toward the center of curvature of the turn, FN sin θ, provides the centripetal force. 1. 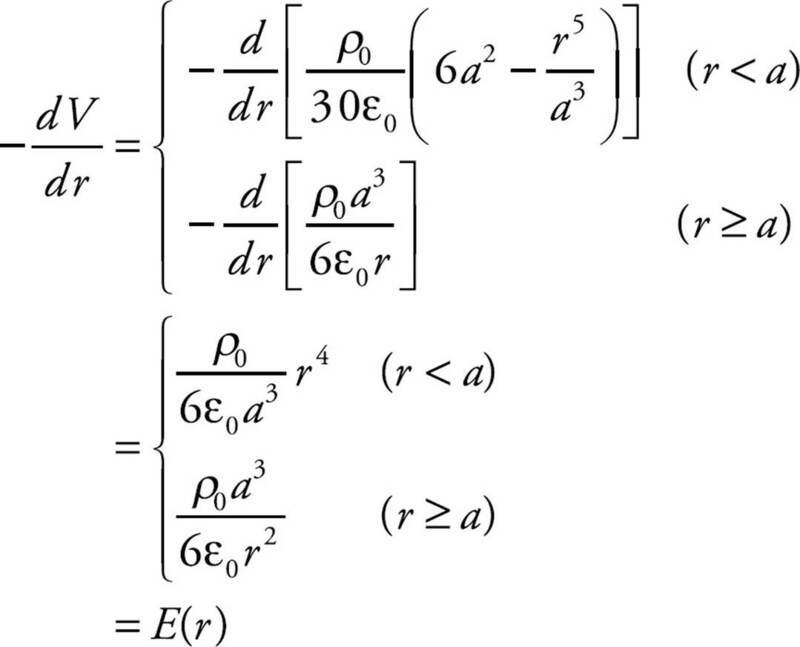 A Since the force F is perpendicular to the displacement, the work it does is zero. 3. 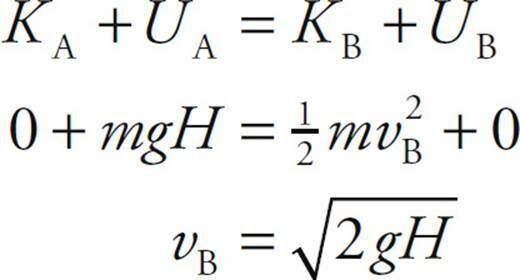 B Since the box (mass m) falls through a vertical distance of h, its gravitational potential energy decreases by mgh. The length of the ramp is irrelevant here. 4. 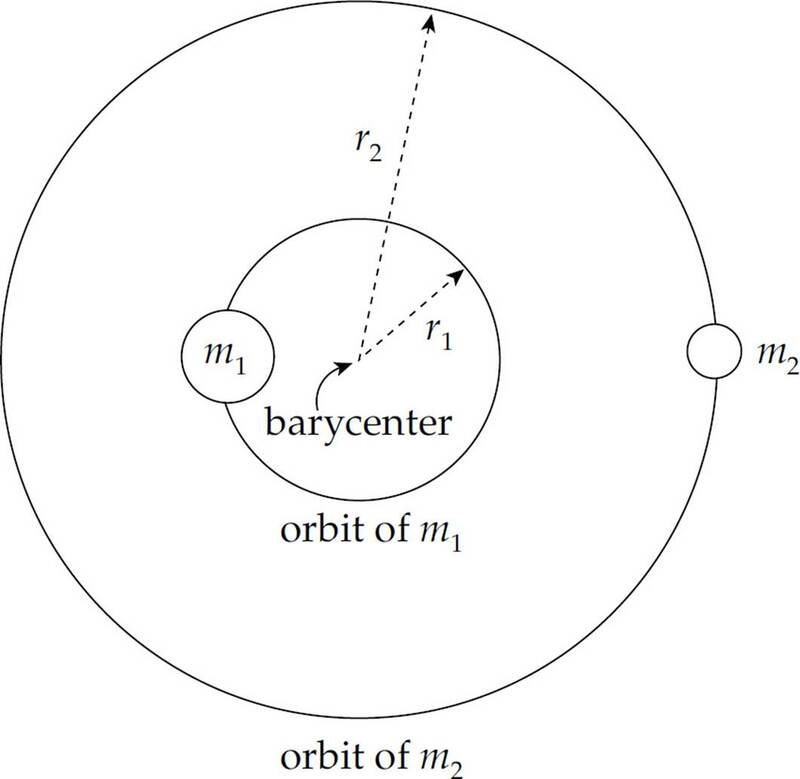 C Since the centripetal force always points along a radius toward the center of the circle, and the velocity of the object is always tangent to the circle (and thus perpendicular to the radius), the work done by the centripetal force is zero. Alternatively, since the object’s speed remains constant, the work–energy theorem tells us that no work is being performed. 5. A The gravitational force points downward while the book’s displacement is upward. 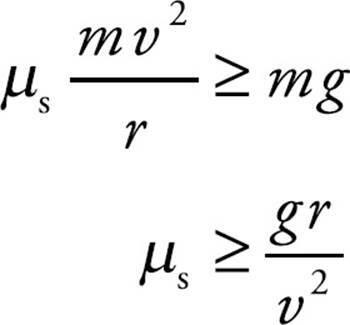 Therefore, the work done by gravity is –mgh = –(2 kg)(10 N/kg)(1.5 m) = –30 J. 6. 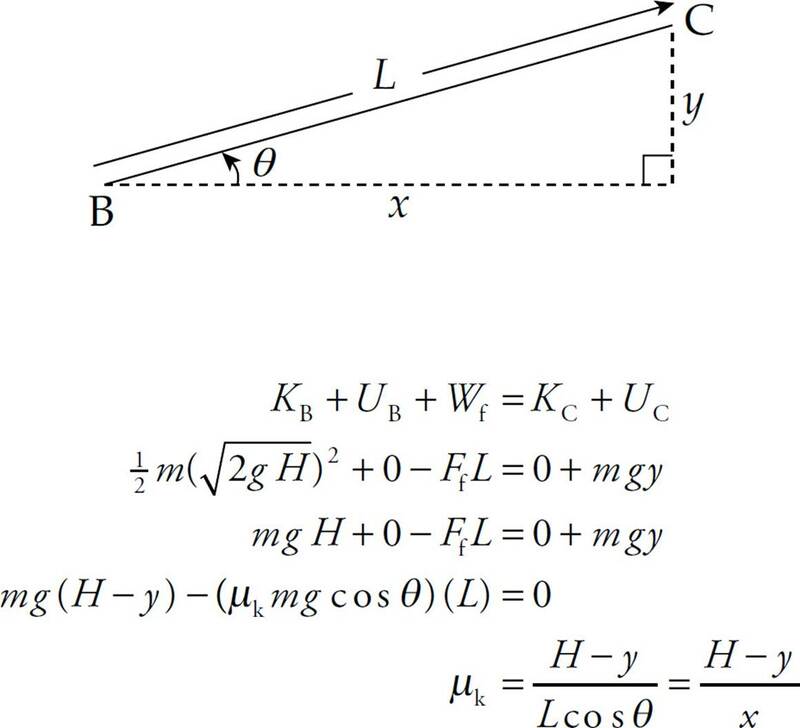 D The work done by gravity as the block slides down the inclined plane is equal to the potential energy at the top (mgh). 7. 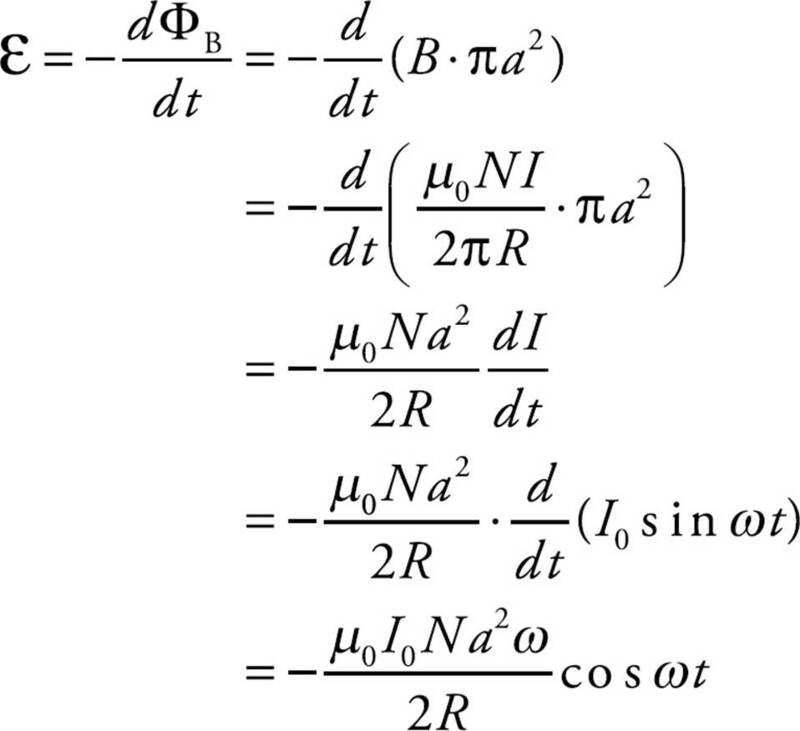 D Since a nonconservative force (namely, friction) is acting during the motion, we use the modified Conservation of Mechanical Energy equation. 8. E Apply Conservation of Mechanical Energy (including the negative work done by Fr, the force of air resistance). 9. E Because the rock has lost half of its gravitational potential energy, its kinetic energy at the halfway point is half of its kinetic energy at impact. 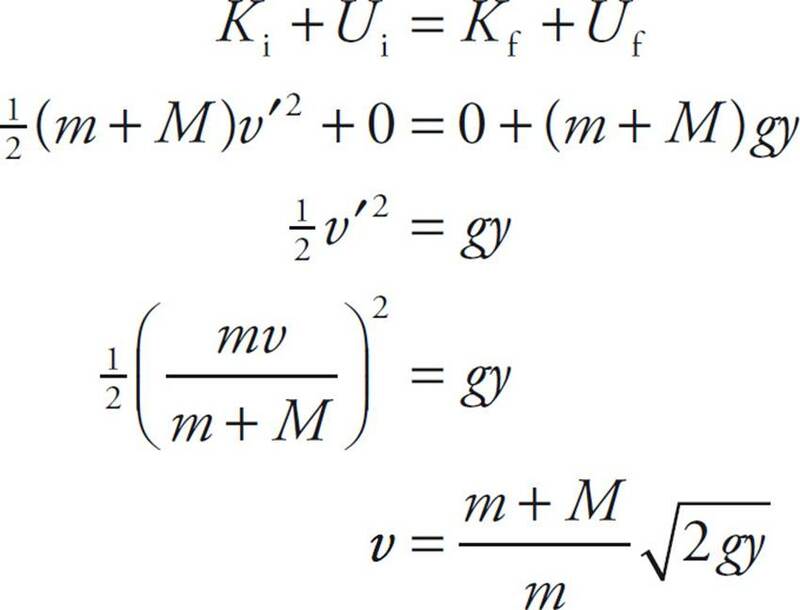 Since K is proportional to v2, if Kat halfway point is equal to Kat impact, then the rock’s speed at the halfway point is its speed at impact. 10. D Using the equation P = Fv, we find that P = (200 N)(2 m/s) = 400 W.
(c) By the work–energy theorem, we want the work done by friction to be equal (but opposite) to the kinetic energy of the box at Point B. 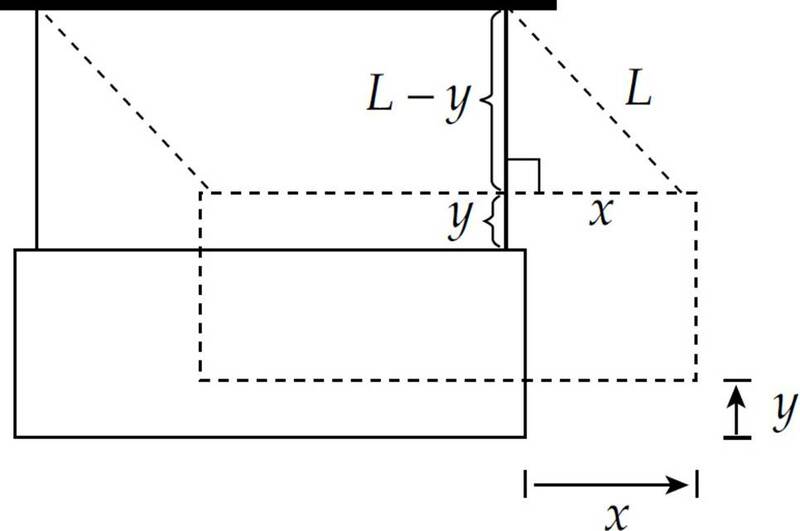 (d) Apply Conservation of Energy (including the negative work done by friction as the box slides up the ramp from B to C). 2. 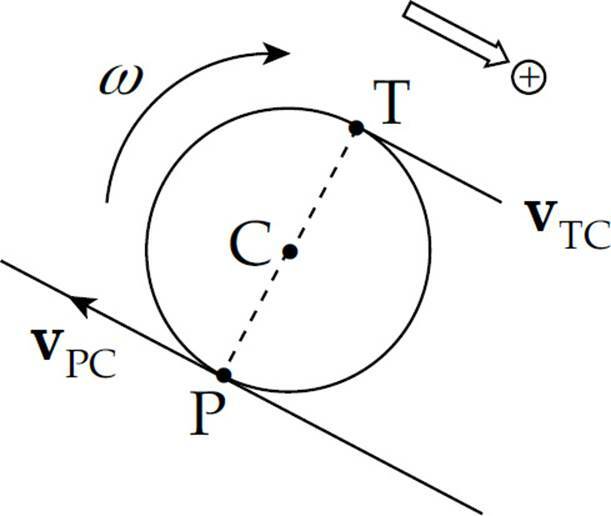 (a) The centripetal acceleration of the car at Point C is given by the equation a = v2C/r, where vC is the speed of the car at C. To find v2C, we apply Conservation of Energy. 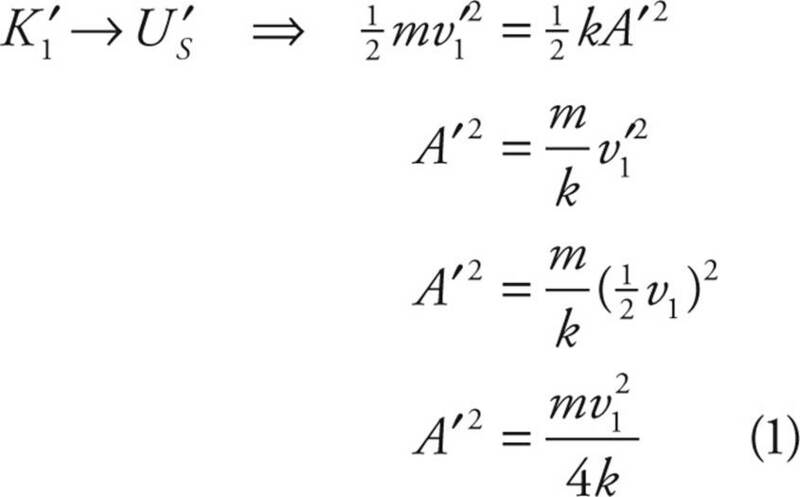 (c) Using the cut-off speed calculated in part (c), we now apply Conservation of Mechanical Energy. 3. (a) The point where x = x1 is a local minimum of the function U(x), and the point where x = x3 is a local maximum. 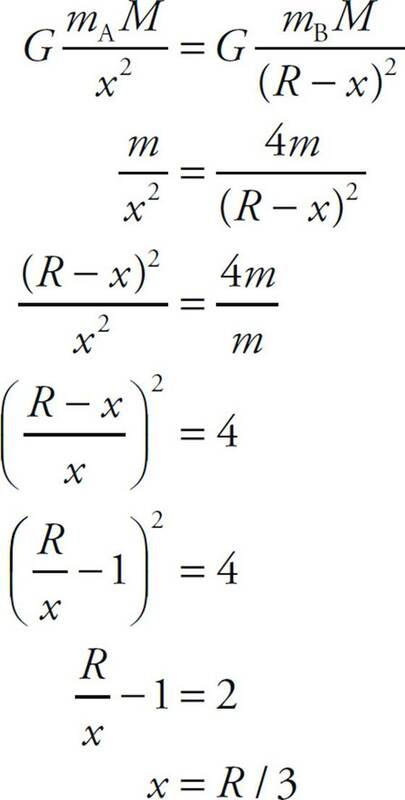 Therefore, at each of these locations, the derivative of U(x) must be equal to 0. 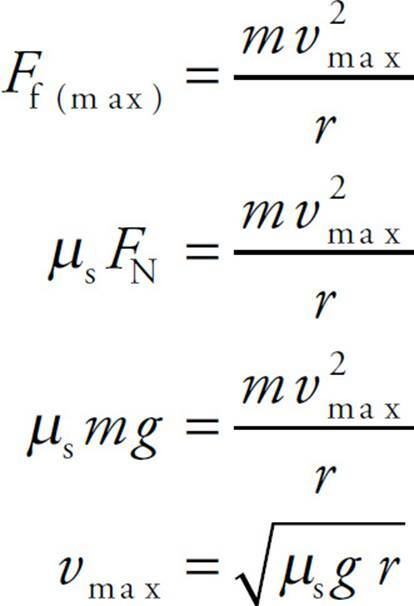 Therefore, x1 = 2 m and x3 = 4 m.
At points a and b the object has no kinetic energy (since U = E2 at these points), so these are the turning points at which the object momentarily comes to rest before being accelerated back toward x = x1 (where the potential energy is minimized). 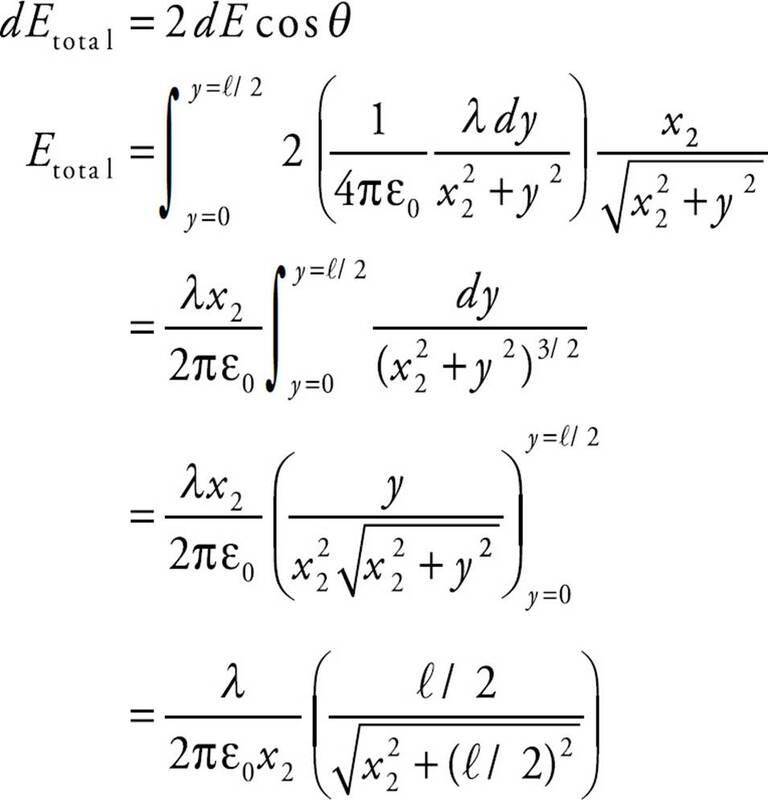 The particle cannot be found at x < a or within the interval b < x < c, since U > E2 in these intervals (and this would imply a negative K, which is impossible). 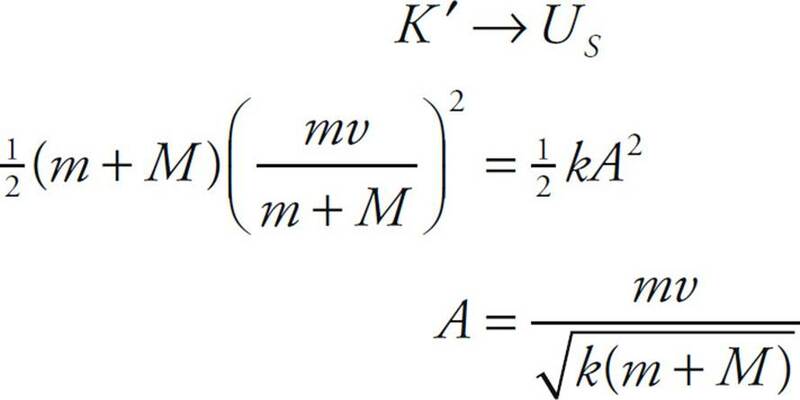 If x > c, then since U decreases, K increases: the particle would move off in the + x direction with increasing speed. (d) Since F(x) = –dU/dx = –[3 – 3(x – 3)2] = 3(x – 3)2 – 3, dividing by m gives a. (e) At x = x1, the particle’s energy is . 4. (a) Work equals the integral of the force and displacement. (b) The work–energy theorem states the work done on an object equals the change in kinetic energy of the object. 1. C The magnitude of the object’s linear momentum is p = mv. If p = 6 kg · m/s and m = 2 kg, then v = 3 m/s. 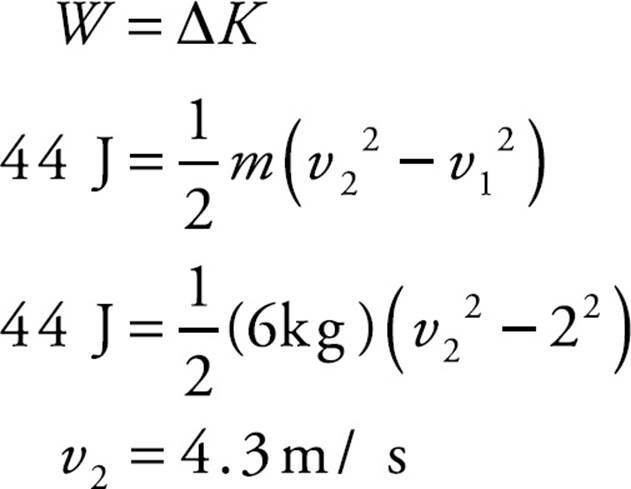 Therefore, the object’s kinetic energy is K = mv2 = (2 kg)(3 m/s)2 = 9 J. 4. D The impulse delivered to the ball is equal to its change in momentum. 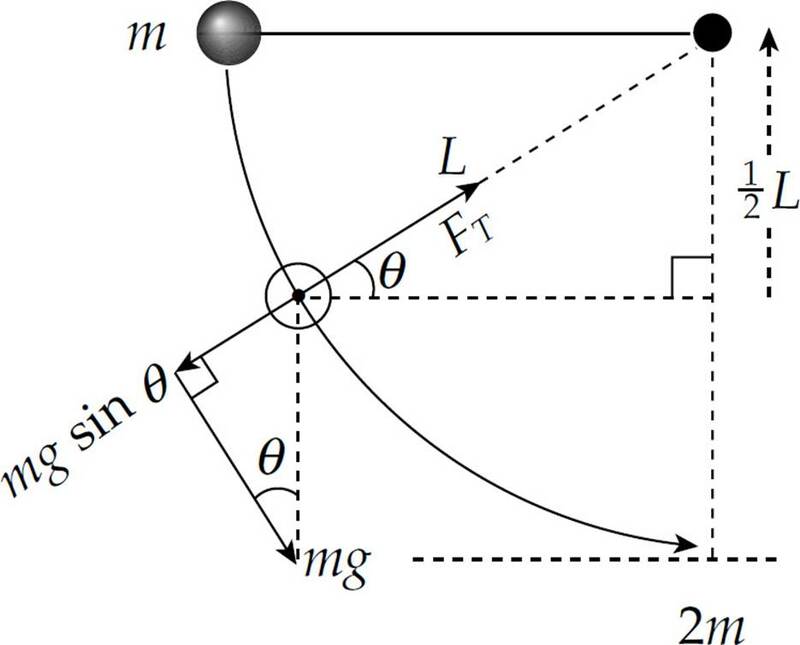 The momentum of the ball was mv before hitting the wall and m(–v) after. 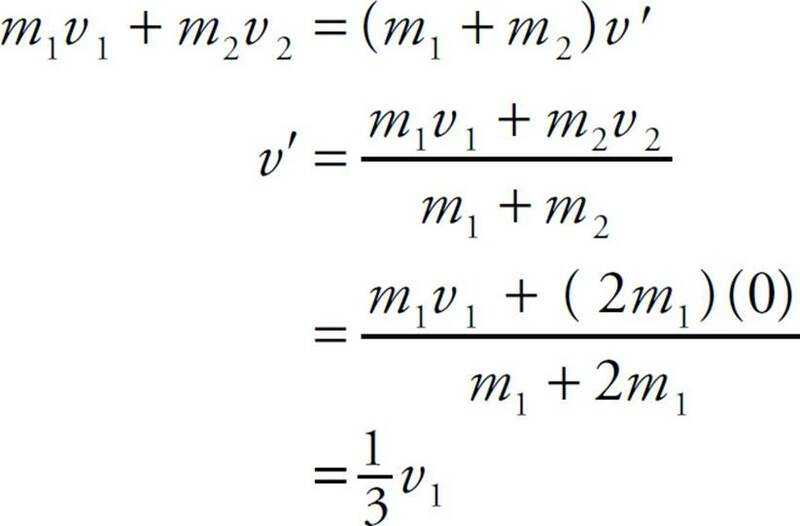 Therefore, the change in momentum is m(–v) – mv = –2mv, so the magnitude of the momentum change (and the impulse) is 2mv. 6. D First, apply Conservation of Linear Momentum to calculate the speed of the combined object after the (perfectly inelastic) collision. 7. 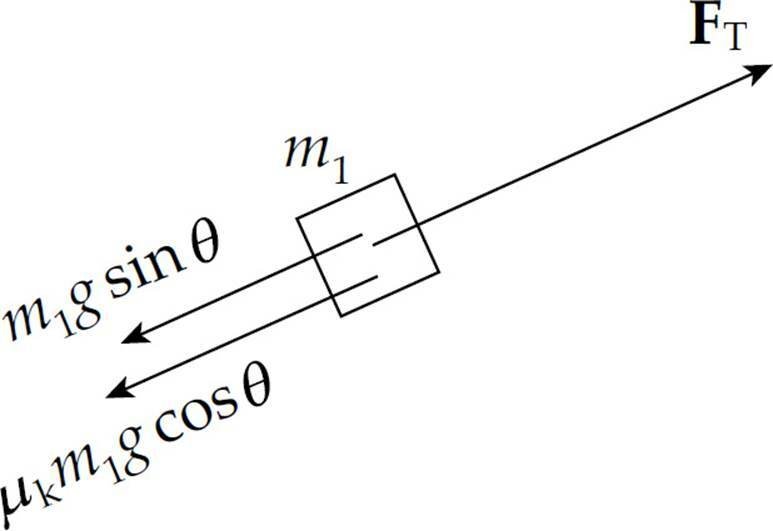 C Total linear momentum is conserved in a collision during which the net external force is zero. If kinetic energy is lost, then by definition, the collision is not elastic. 9. 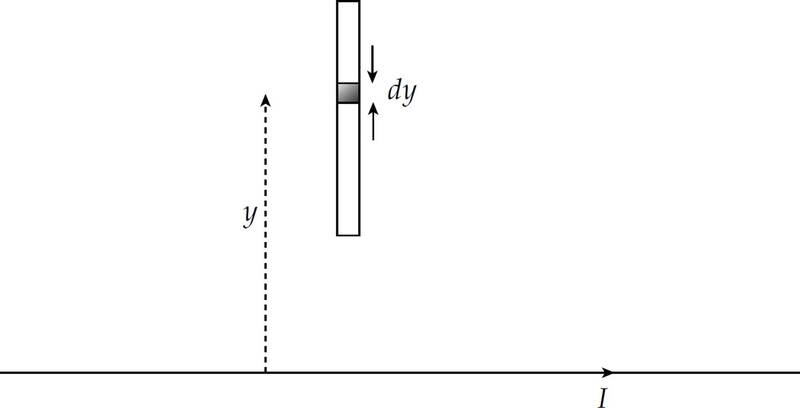 D The linear momentum of the bullet must have the same magnitude as the linear momentum of the block in order for their combined momentum after impact to be zero. The block has momentum MV to the left, so the bullet must have momentum MV to the right. Since the bullet’s mass is m, its speed must be v = MV/m. 10. C In a perfectly inelastic collision, kinetic energy is never conserved; some of the initial kinetic energy is always lost to heat and some is converted to potential energy in the deformed shapes of the objects as they lock together. 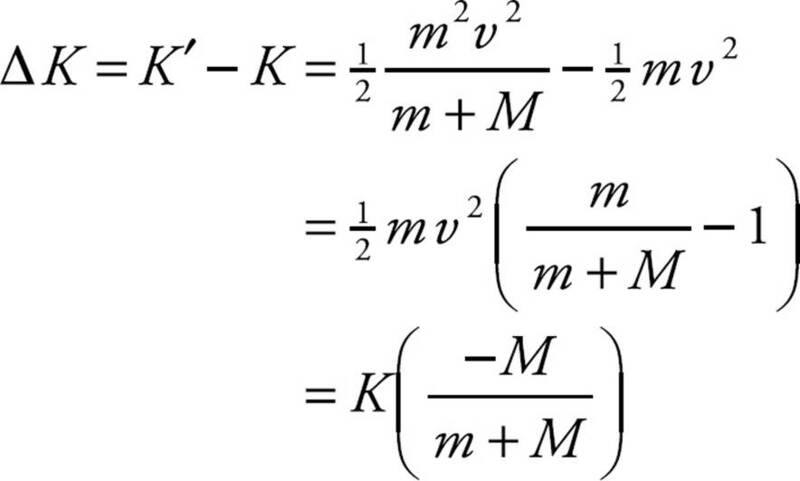 Therefore, the fraction of the bullet’s original kinetic energy that was lost is M/(m + M). This energy is manifested as heat (the bullet and block are warmer after the collision than before), and some was used to break the intermolecular bonds within the wooden block to allow the bullet to penetrate. (d) No; momentum is conserved only when the net external force on the system is zero (or at least negligible). In this case, the block and bullet feel a net nonzero force that causes it to slow down as it swings upward. Since its speed is decreasing as it swings upward, its linear momentum cannot remain constant. Thus, the objects’ post-collision velocity vectors are perpendicular to each other. 4. C Use Big Five #3 for rotational motion. 5. D The torque is τ = rF = (0.20 m)(20 N) = 4 N · m.
7. B The stick will remain at rest in the horizontal position if the torques about the suspension point are balanced. Note that the length of the rectangular frame, L, is irrelevant here. 1. 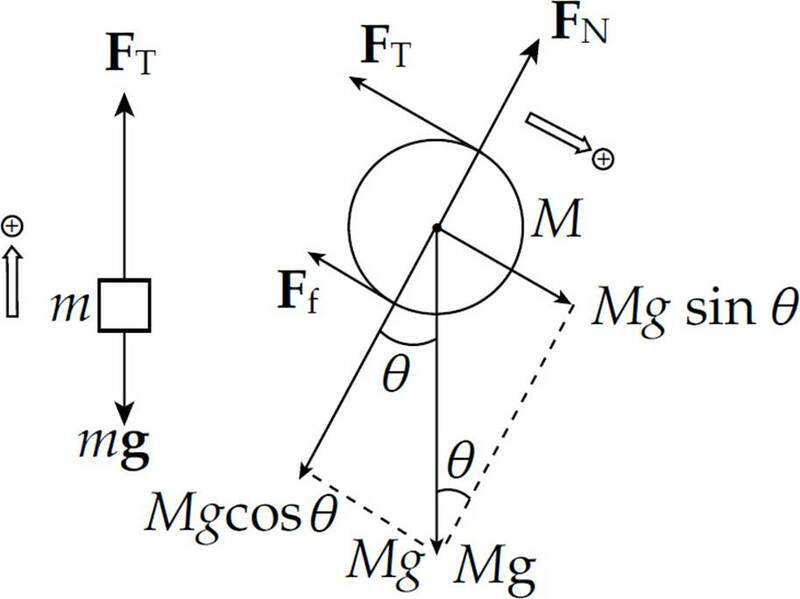 (a) Apply Conservation of Mechanical Energy, remembering to take into account the translational kinetic energy of the falling block (m2), the rising block (m1), and the rotating pulley. (c) Since Block 2 (and Block 1) moved a distance h during the motion, a point on the rim of the pulley must also move through a distance h. Therefore, θ = h/R. 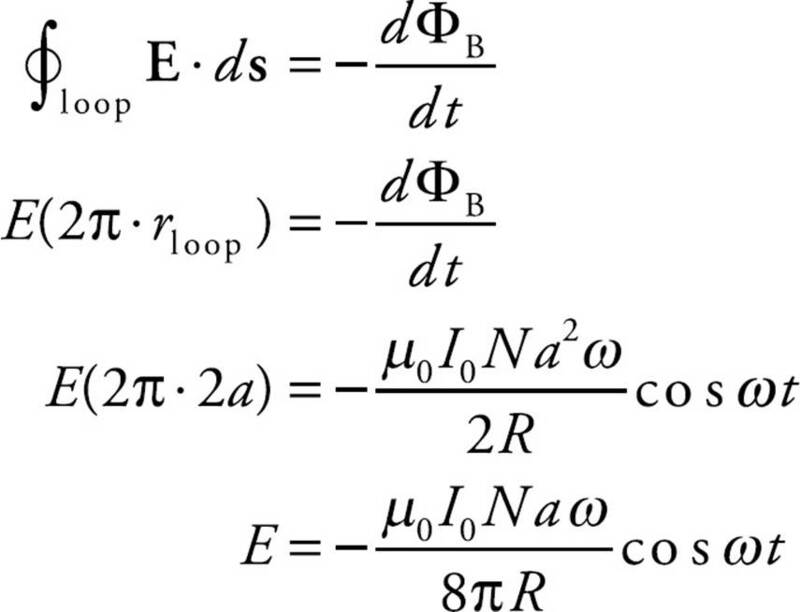 (d) Use Big Five #1 (for translational motion). (b) One way to derive the desired result is to notice that the velocity of T relative to P is equal to the velocity of T relative to C plus the velocity of C relative to P (vTP = vTC + vCP). Since the velocity of C relative to P is the opposite of the velocity of P relative to C (vCP = –vPC), we have vTP = vTC – vPC. Relative to C, point T is moving forward with speed Rω and point P is moving backward with speed Rω. Therefore, vTP = (+Rω) – (–Rω) = +2Rω = 2vcm. Another method is to think of the disk as executing pure rotation instantaneously about the contact Point P. From this point of view (with P as pivot), the distance to C is R, and the distance to T is 2R. 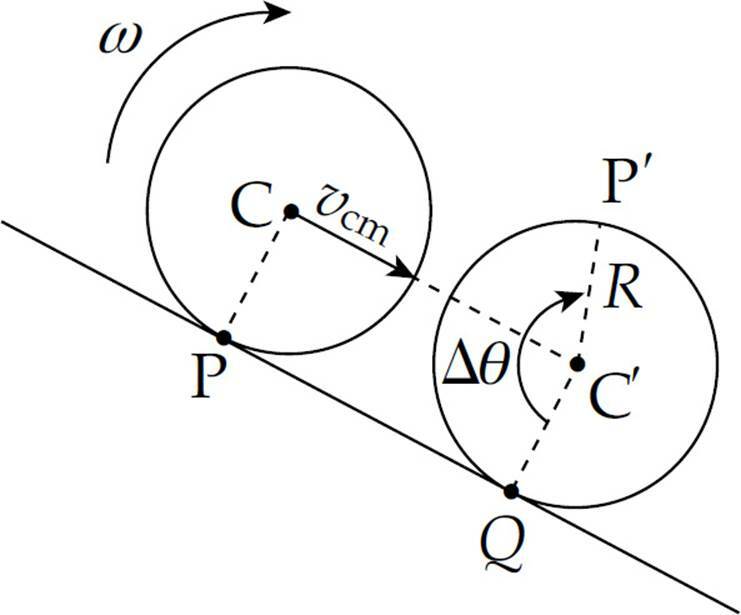 Therefore, the linear speed of C is Rω and that of T is 2Rω, which implies that the linear speed of point T is twice that of point C, as desired. (c) The speed with which the block rises, vb, is equal to the speed at which the thread wraps around the cylinder, which is 2vcm, as shown in part (b). 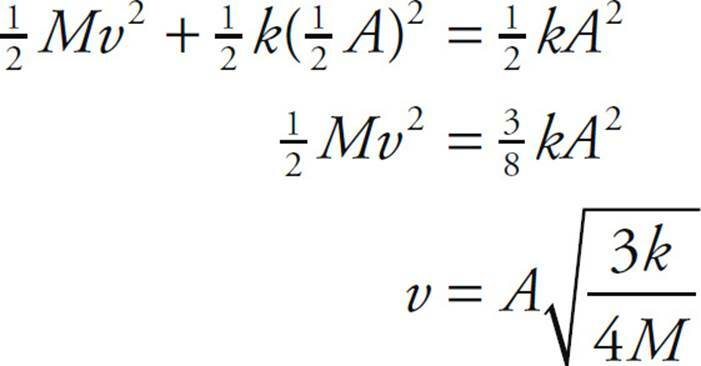 Therefore, differentiating the equation vb = 2vcm with respect to time, we get ab = 2acm. That is, the acceleration of the block is equal to twice that of the (center of mass of the) cylinder. (d) First draw free-body diagrams for the block and the cylinder. Now for the algebra. Adding Equations (2) and (3) gives . Multiplying both sides of Equation (1) by 2 gives 2FT - 2mg = 4macm. 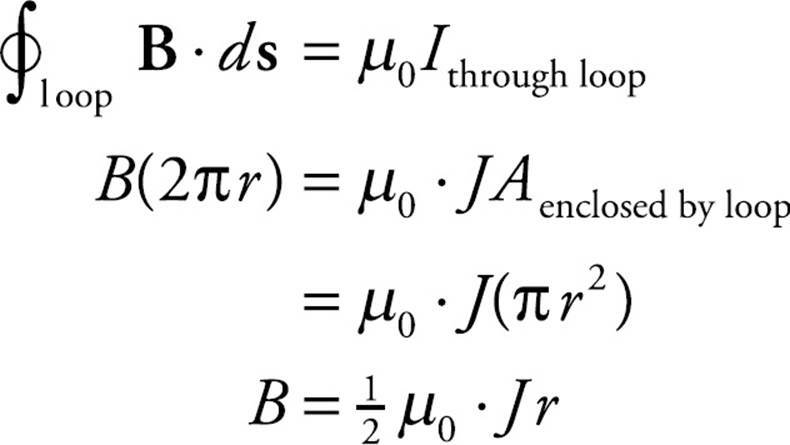 Adding these last two equations allows us to find acm, the linear acceleration of the cylinder. 3. 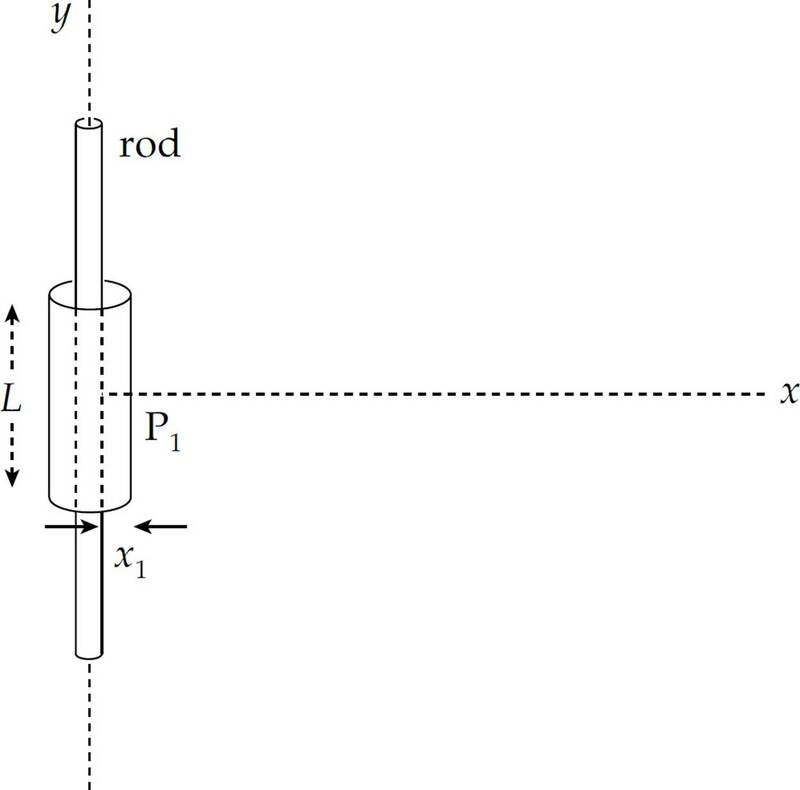 (a) Consider a rod of length 2L with the pivot at its center. 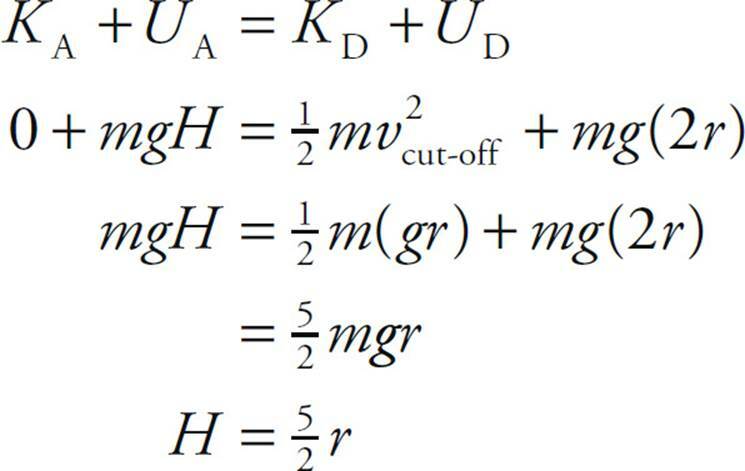 Since the rod is uniform, its linear mass density is M/(2L), so the mass of a segment of length dx is M dx/(2L). 1. 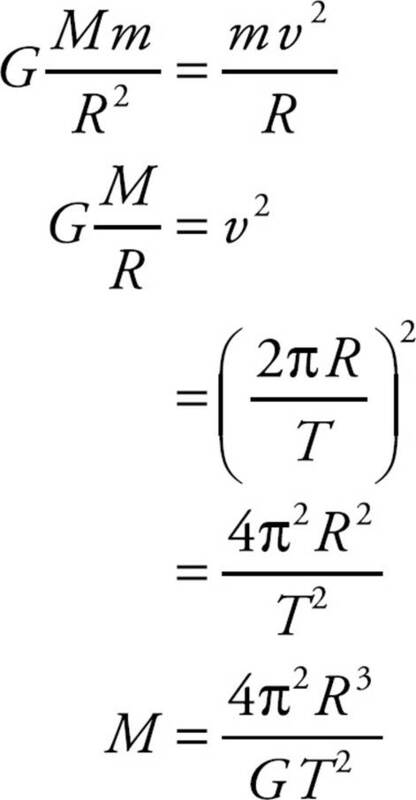 A Gravitational force obeys an inverse-square law: Fgrav ∝ 1/r2. Therefore, if r increases by a factor of 2, then Fgrav decreases by a factor of 22 = 4. 2. E Mass is an intrinsic property of an object that does not change with location. This eliminates choices A and C. If an object’s height above the surface of Earth is equal to 2RE, then its distance from the center of Earth is 3RE. Thus, the object’s distance from Earth’s center increases by a factor of 3, so its weight decreases by a factor of 32 = 9. 3. 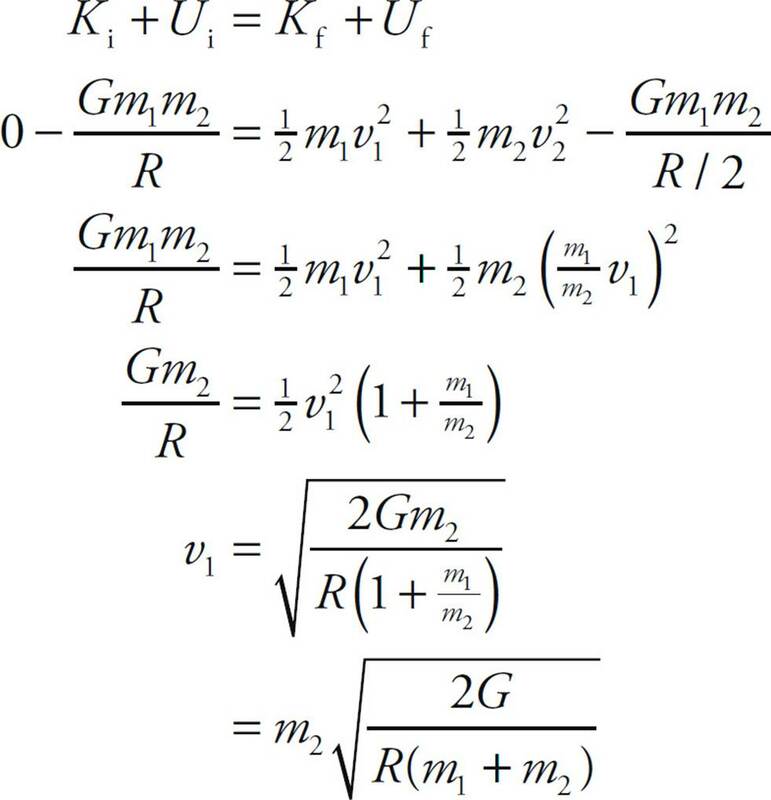 C The gravitational force that the Moon exerts on the planet is equal in magnitude to the gravitational force that the planet exerts on the moon (Newton’s Third Law). 5. 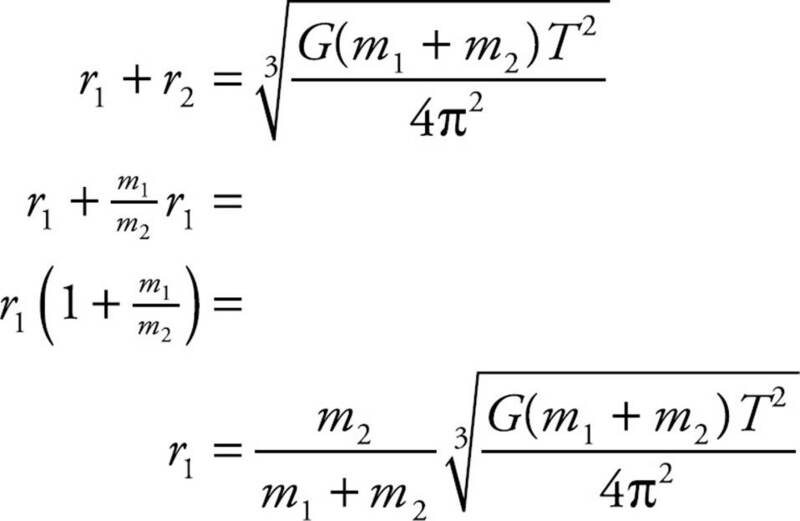 B The gravitational pull by Earth provides the centripetal force on the satellite, so GMm/R2 = mv2/R. 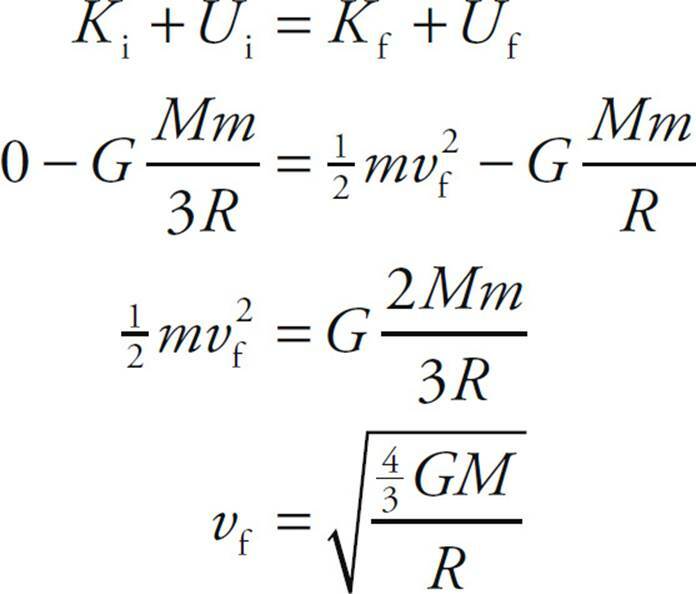 This gives mv2 = GMm/2R, so the kinetic energy K of the satellite is inversely proportional to R. Therefore if R increases by a factor of 2, then K decreases by a factor of 2. 8. 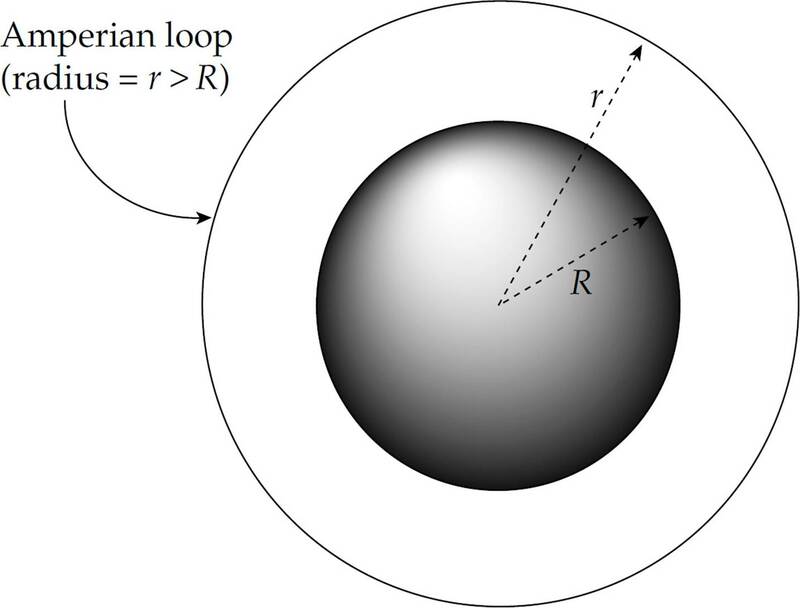 B Kepler’s Third Law says that T2 ∝ R3 for a planet with a circular orbit of radius R. Since T ∝ R3/2, if R increases by a factor of 9, then T increases by a factor of 93/2 = (32)3/2 = 33 = 27. 10. E The force of gravity is the centripetal force, so we can solve for the velocity of each satellite and compare them. The direction of a1 is toward Sphere 2. The direction of a2 is toward Sphere 1. 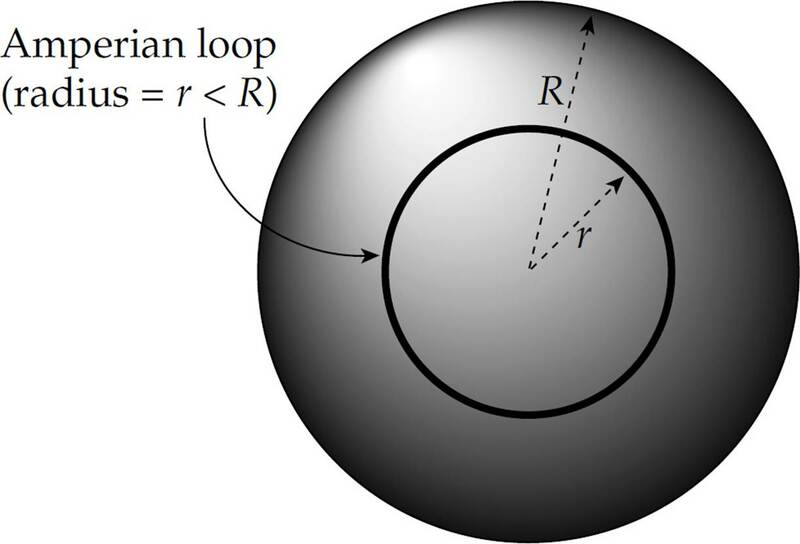 (e) The centripetal force on each sphere is provided by the gravitational pull by the other sphere. 1. 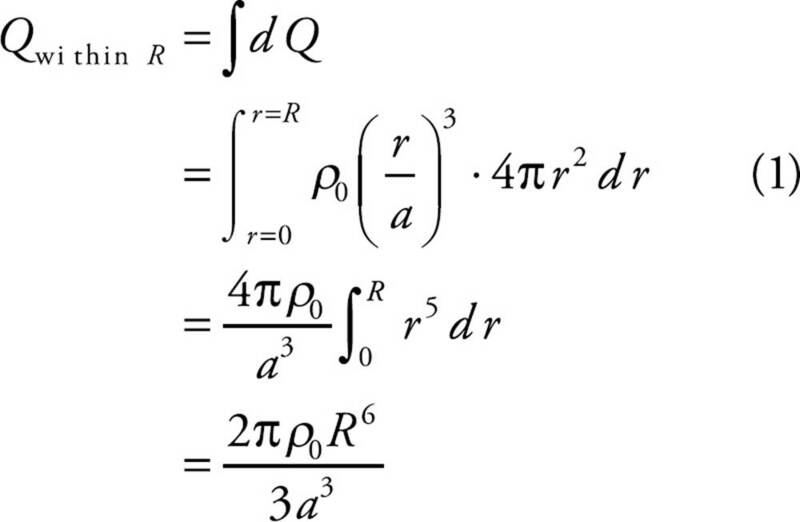 D The acceleration of a simple harmonic oscillator is not constant, since the restoring force—and, consequently, the acceleration—depends on position. Therefore Statement I is false. However, both Statements II and III are fundamental, defining characteristics of simple harmonic motion. 2. 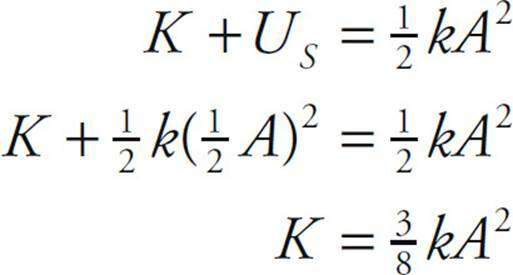 C The acceleration of the block has its maximum magnitude at the points where its displacement from equilibrium has the maximum magnitude (since a = F/m = kx/m). At the endpoints of the oscillation region, the potential energy is maximized and the kinetic energy (and hence the speed) is zero. 3. 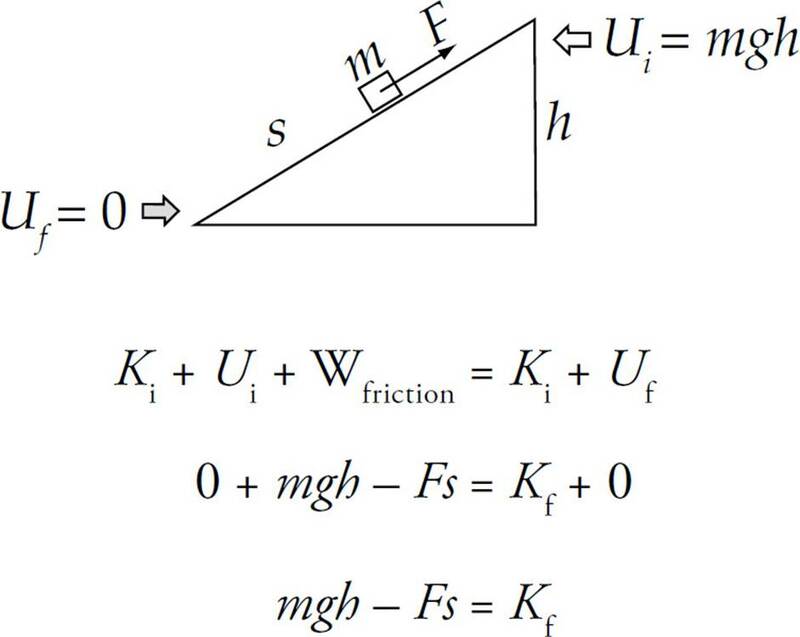 E Due to Conservation of Mechanical Energy, K + US is a constant for the motion of the block. 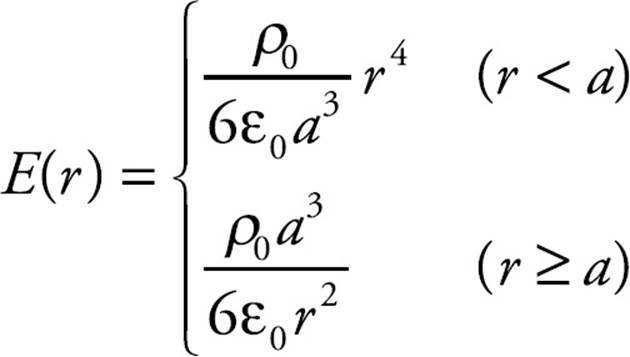 At the endpoints of the oscillation region, the block’s displacement, x, is equal to ±A. 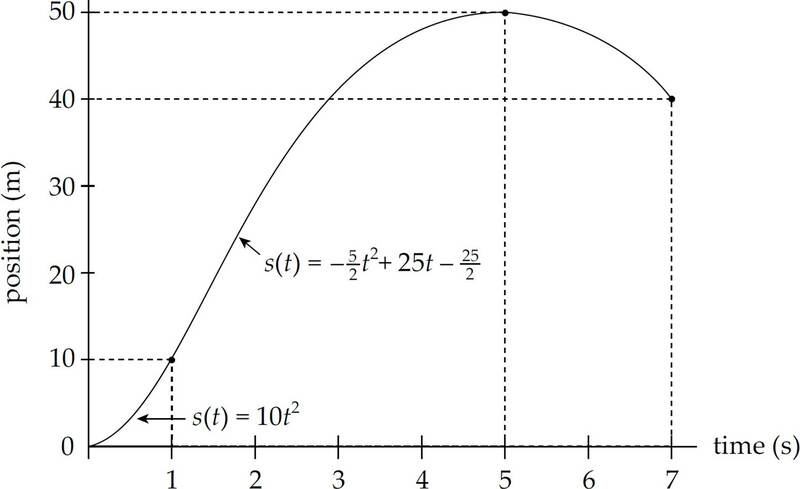 Since K = 0 here, all the energy is in the form of potential energy of the spring, kA2. Because kA2 gives the total energy at these positions, it also gives the total energy at any other position. 4. C As we derived in Chapter 10, Example 2, the maximum speed of the block is given by the equation vmax = . Therefore, vmax is inversely proportional to . If m is increased by a factor of 2, then vmax will decrease by a factor of . 5. D The period of a spring–block simple harmonic oscillator is independent of the value of g. (Recall that T = ) Therefore, the period will remain the same. Therefore, the equation that gives the block’s position, x = A sin (ωt + φ0), becomes x = 6 sin (10t + φ0). Because the block is at x = 6 cm at time t = 0, the initial phase angle φ0 must be π. 8. A Starting with the equation x = A sin(ωt + φ0), we differentiate with respect to t to find the velocity function: v = ẋ = Aω cos(ωt + φ0). Since the maximum value of cos(ωt + φ0) is 1, the maximum value of v is vmax = Aω. 9. 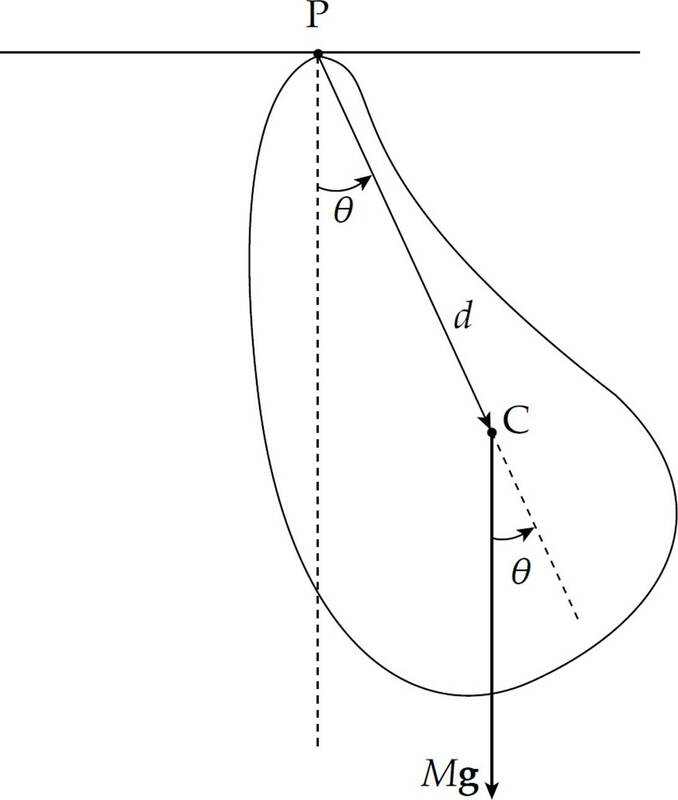 C For small angular displacements, the period of a simple pendulum is essentially independent of amplitude. The net force toward the center of the bob’s circular path is FT – mg cos θmax. This must provide the centripetal force, mv2/L. But since the speed of the bob at this moment is zero (v = 0), we get FT = mg cos θmax. 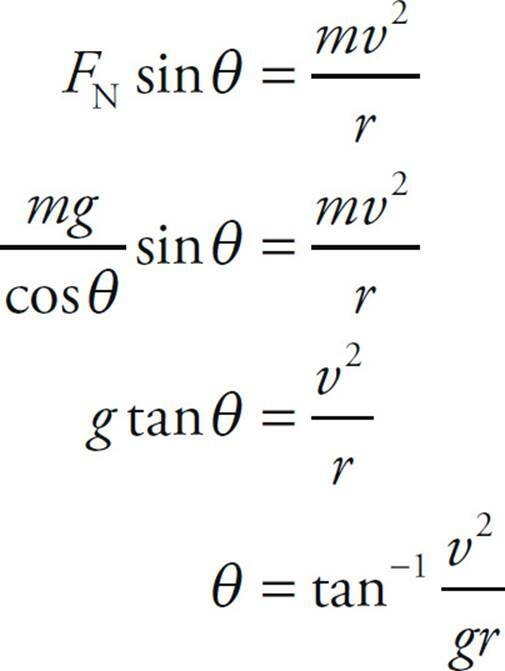 The acceleration is purely tangential here, equal to (mg sin θmax)/m = g sin θmax. 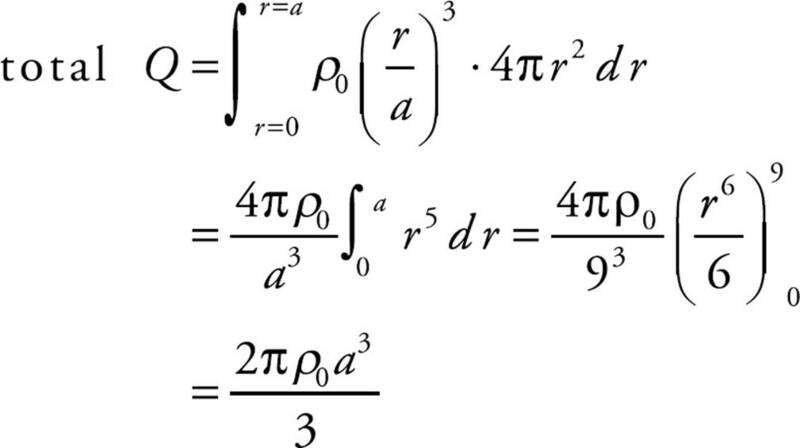 and substitute into this the result of Equation (3). 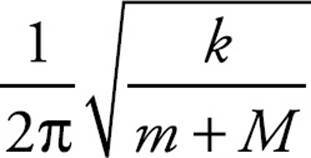 (d) The period of a spring–block simple harmonic oscillator depends only on the spring constant k and the mass of the block. Since neither of these changes, the period will remain the same; that is, T′ = T0. 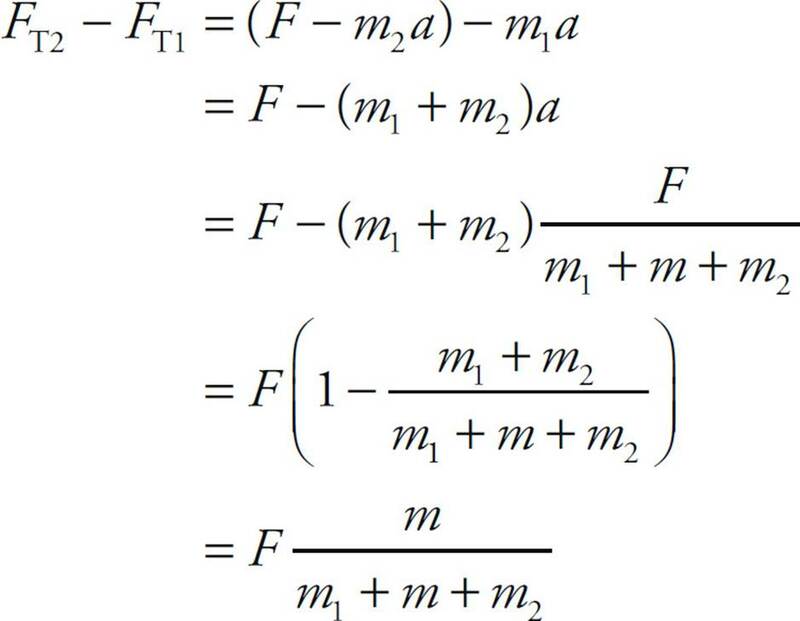 (c) Since the mass on the spring is m + M, f = . (e) No, since the period depends only on the mass and the spring constant k.
(f) Yes. For example, if the clay had landed when the block was at x = A, the speed of the block would have been zero immediately before the collision and immediately after. No change in the block’s speed would have meant no change in K, so no change in E, so no change in A = . 4. (a) Since the weight provides a clockwise torque (which is negative), we have τ = –dMg sin θ. 1. 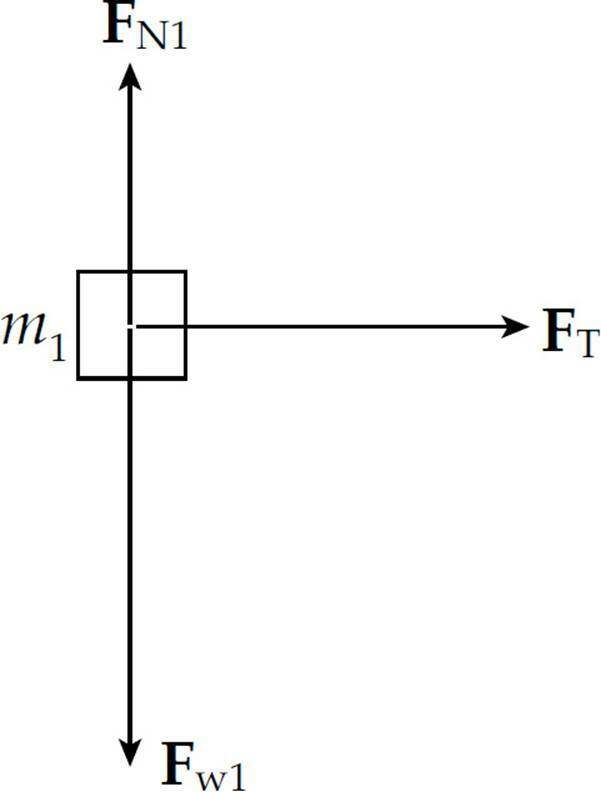 D Electrostatic force obeys an inverse-square law: FE 1/r2. Therefore, if r increases by a factor of 3, then FE decreases by a factor of 32 = 9.
we see that kq2 >> Gm2, so FE is much stronger than FG. 4. 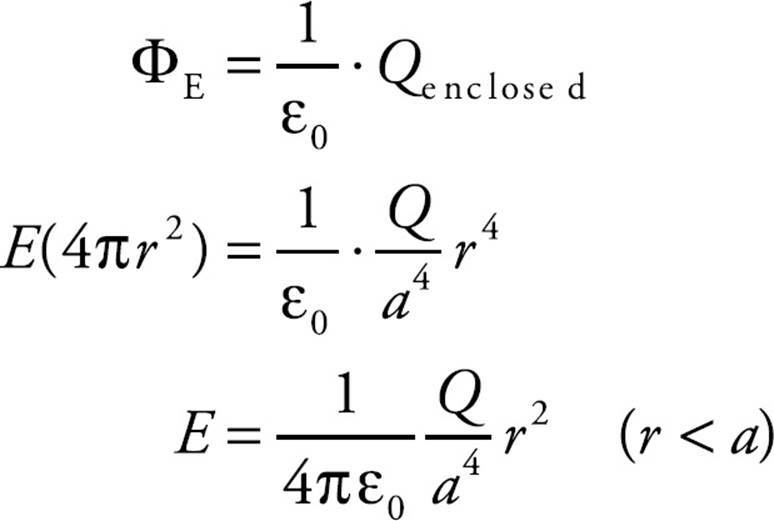 E Since P is equidistant from the two charges, and the magnitudes of the charges are identical, the strength of the electric field at P due to +Q is the same as the strength of the electric field at P due to –Q. The electric field vector at P due to +Q points away from +Q, and the electric field vector at P due to –Q points toward –Q. Since these vectors point in the same direction, the net electric field at P is (E to the right) + (E to the right) = (2E to the right). As r increases (that is, as the small sphere is pushed away), a decreases. However, since a is always positive, the small sphere’s speed, v, is always increasing. 6. B Since FE (on q) = qE, it must be true that FE (on –2q) = –2qE = –2FE. 7. D All excess electric charge on a conductor resides on the outer surface. 8. 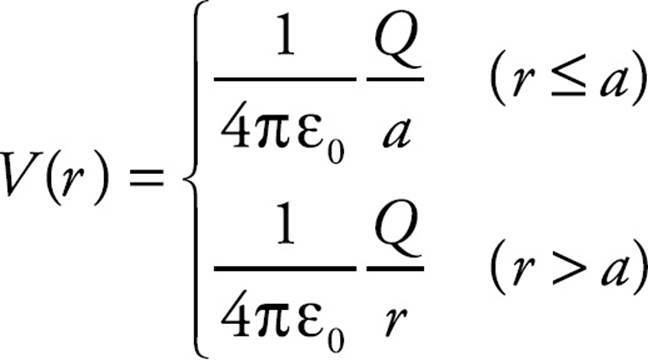 B The net electric flux through the Gaussian surface, ΦE, is equal to (1/ε0) times the net charge enclosed by the surface, Q2 + Q3. However, the net electric field vector at P is equal to the sum of the electric field vectors due to each of the four charges individually. 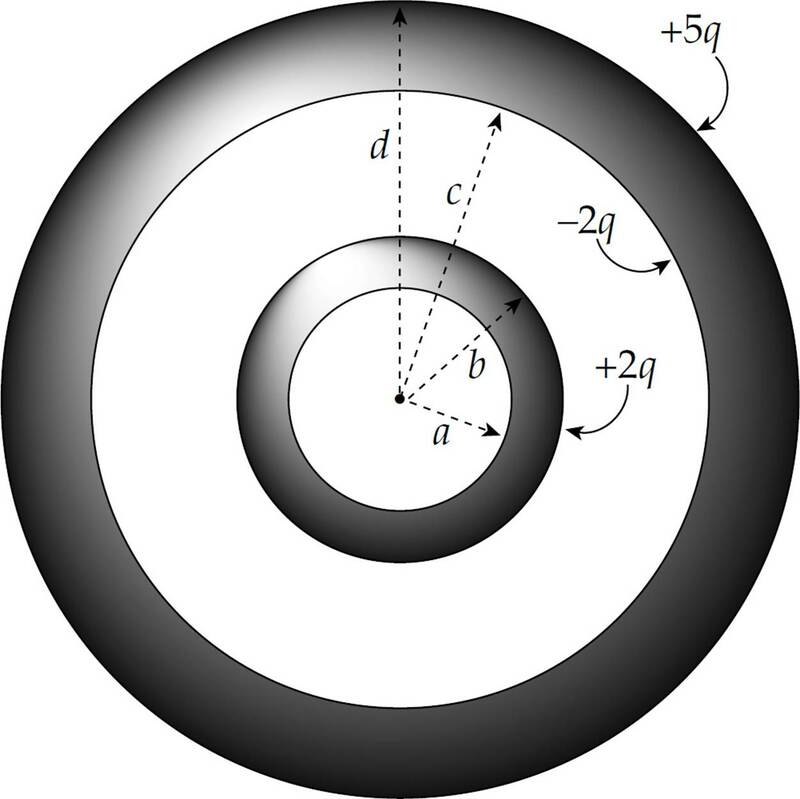 Since the charge on the sphere is negative, the direction of E at any point is directed radially inward. 10. A By definition, an electric dipole consists of two equal but opposite charges. Therefore a Gaussian surface enclosing both charges would enclose zero net charge. By Gauss’s Law, the electric flux is zero as well (since ΦE = Qenclosed/ε0). 1. 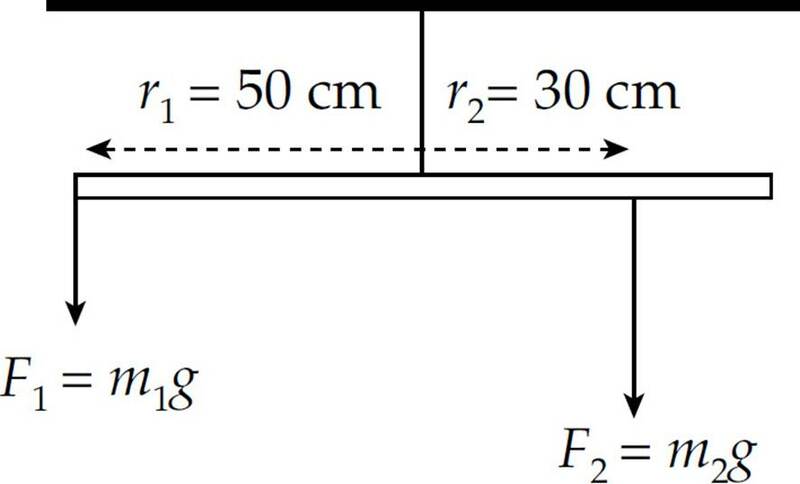 (a) From the figure below, we have F1-2 = F1/cos 45°. (b) No. If q = Q/2 , as found in part (a), then the net force on –q is not zero. (c) No. 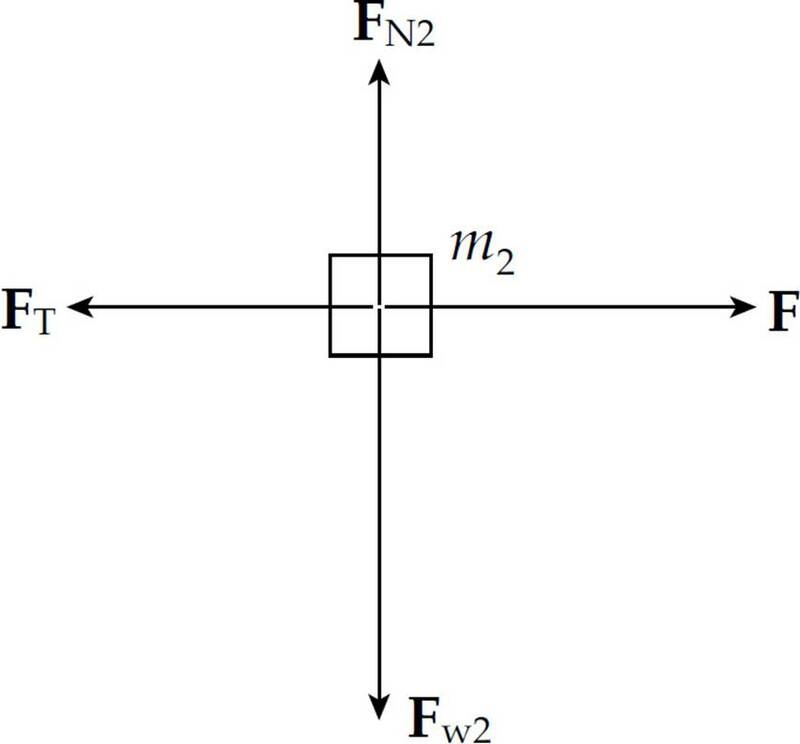 At no point on the x-axis will the individual electric field vectors point in exactly opposite directions. Therefore, at no point on the x-axis could the total electric field be zero. (d) Yes. 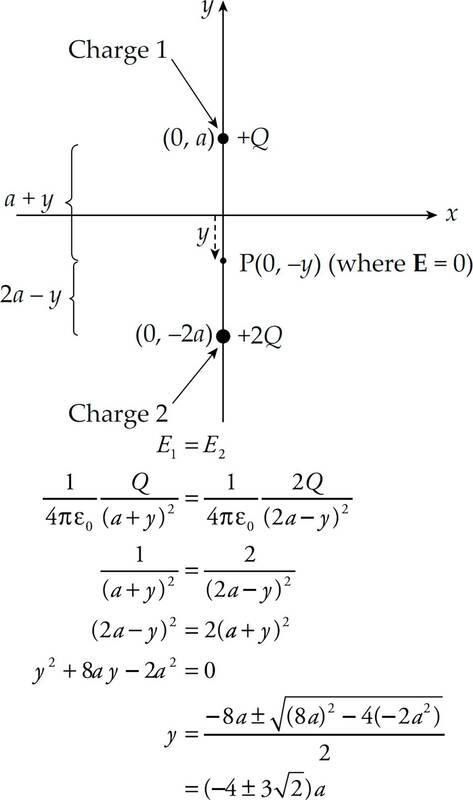 There will be a Point P on the y-axis between the two charges, where the electric fields due to the individual charges will cancel each other out. Disregarding the value y = (because it would place the point P below Charge 2 on the y-axis, where the electric field vectors do not point in opposite directions), we have that E = 0 at the point P = (0, –y) = (0, ). (b) Within each metallic shell, there is no excess charge. The inner surface of the inner shell also has no excess charge. See the figure above for part (a) for the charges residing on the other surfaces of the shells. 4. 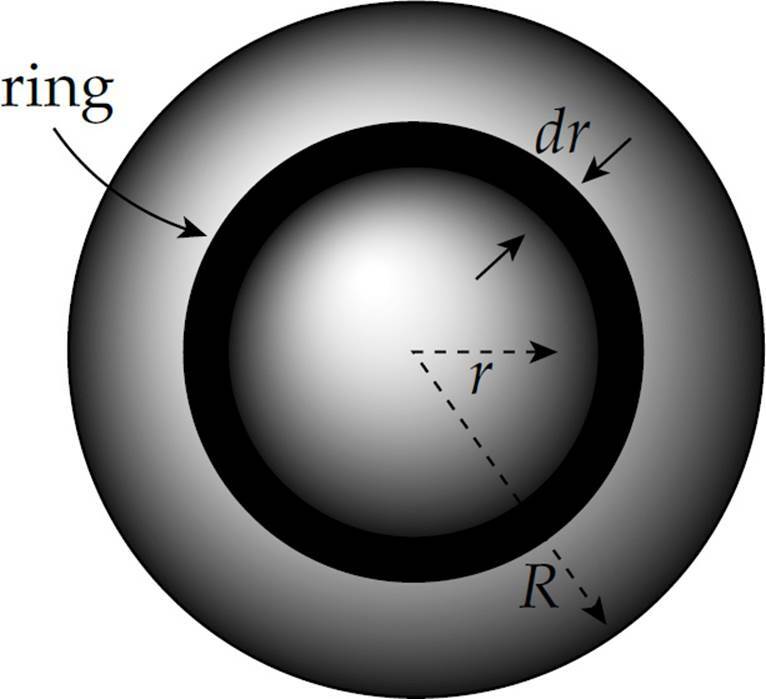 (a) Very close to the rod, the rod behaves as if it were “infinitely long.” Construct a cylindrical Gaussian surface of radius x1 and length L centered on the rod. By symmetry the electric field at P1 must point radially away from the rod, so the field at P1 must point in the positive x direction. 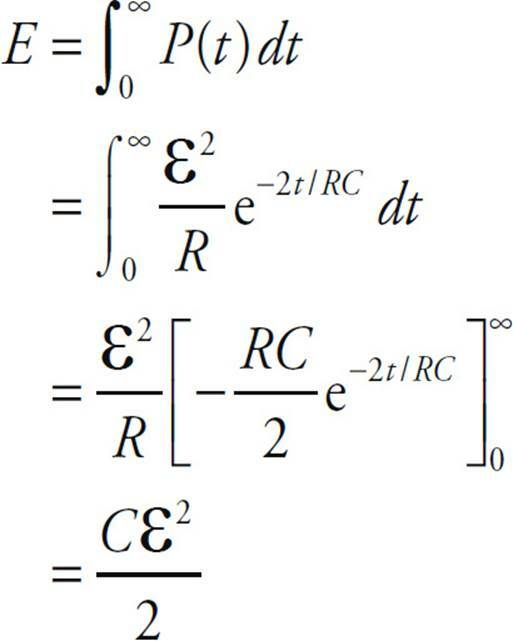 (b) The total charge on the rod is equal to its linear charge density times its total length: Q = λ . (c) If x2 is not small compared to , then we must calculate the electric field at P2 by integration. 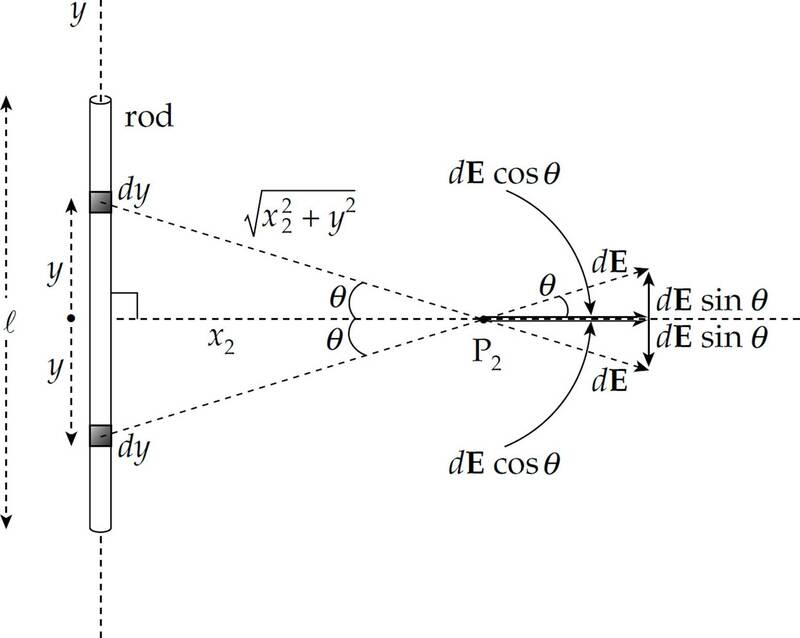 Consider two symmetrically located line elements along the rod, each of length dy, at a distance y above and below the origin. 5. (a) Volume charge density has units of charge per unit volume, that is, [ρ] = C/m3. Since r/a has no units, ρs must also have units of C/m3. 1. 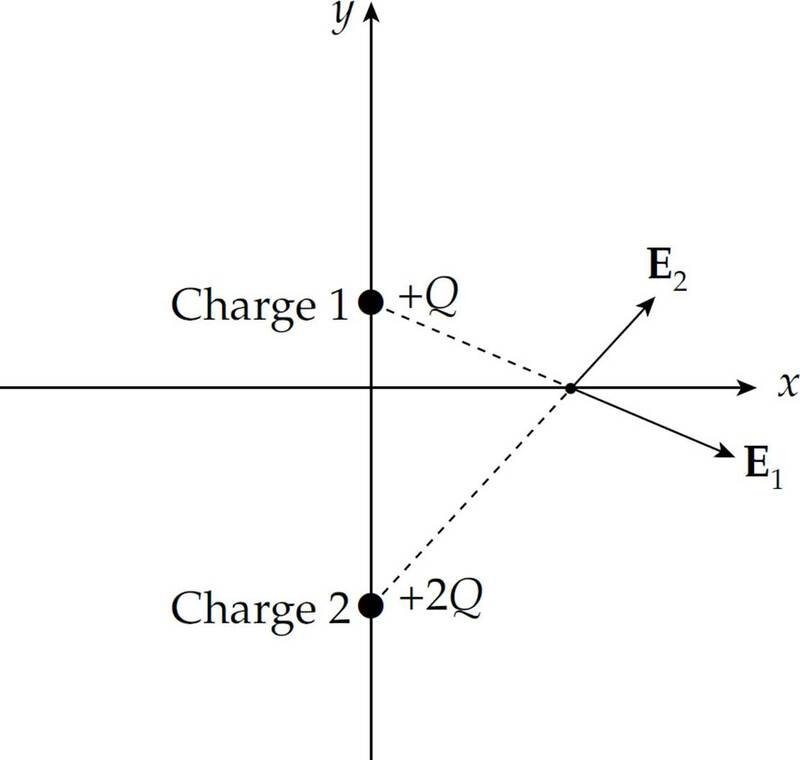 E A counterexample for Statement I is provided by two equal positive charges; at the point midway between the charges, the electric field is zero, but the potential is not. 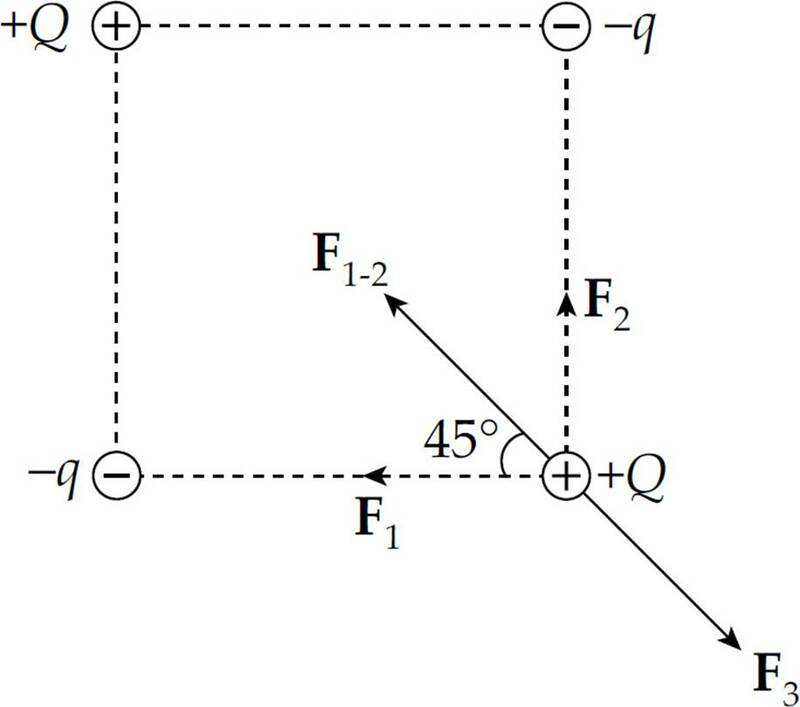 A counterexample for Statement II is provided by an electric dipole (a pair of equal but opposite charges); at the point midway between the charges, the electric potential is zero, but the electric field is not. As for Statement III, consider a single positive point charge +Q. 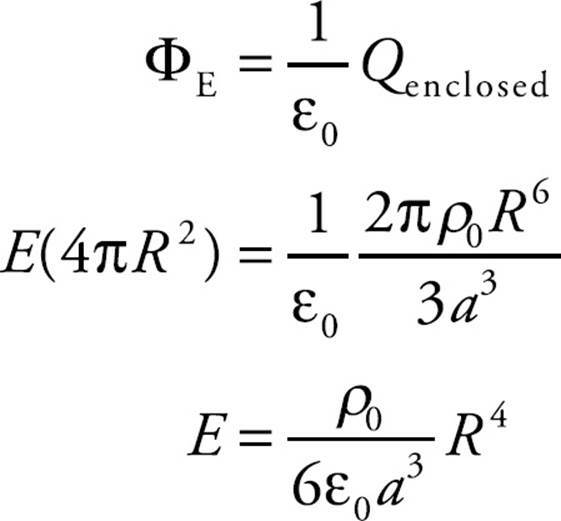 Then at a distance r from this source charge, the electric field strength is E = kQ/r2 and the potential is V = kQ/r. Thus, V = rE, so V is not inversely proportional to E.
2. C By definition, UE = –WE, so if WE is negative, then UE is positive. 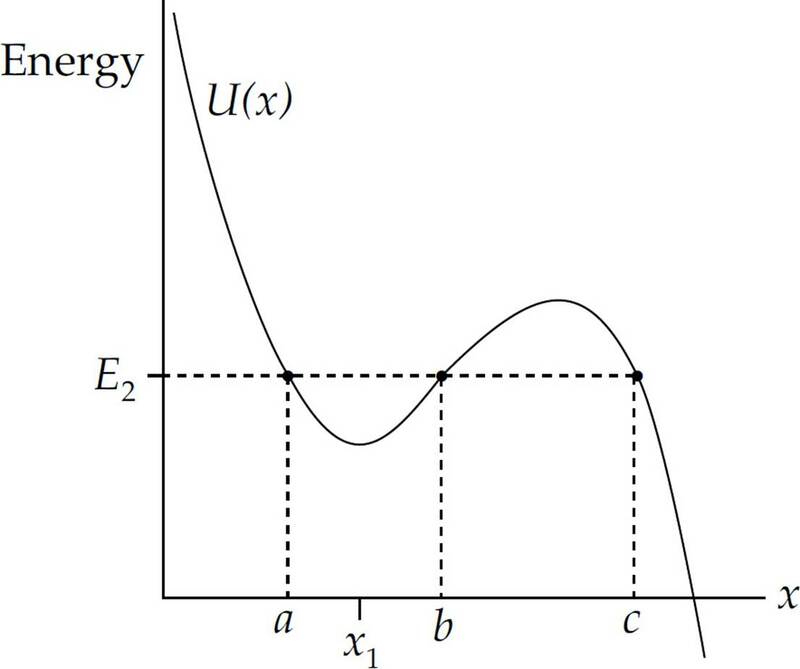 This implies that the potential energy, UE, increases. 4. B Use the definition V = –WE/q. 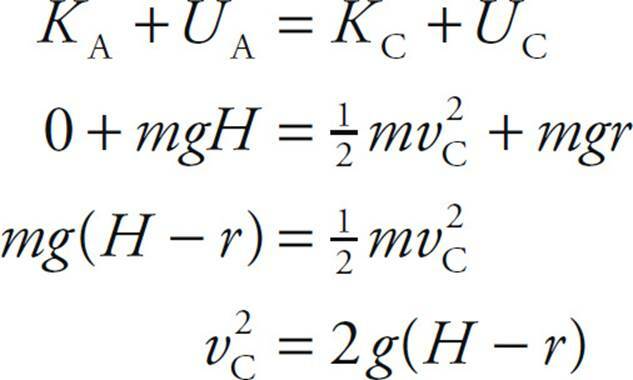 If an electric field accelerates a negative charge doing positive work on it, then WE > 0. If q < 0, then –WE/q is positive. Therefore, V is positive, which implies that V increases. Now, since q1 + q2 = –Q + –Q = –2Q, the fact that q1 must equal q2/4 means that (q2/4) + q2 = –2Q, which gives q2 = (–8/5)Q and q1 = (–2/5)Q. 8. 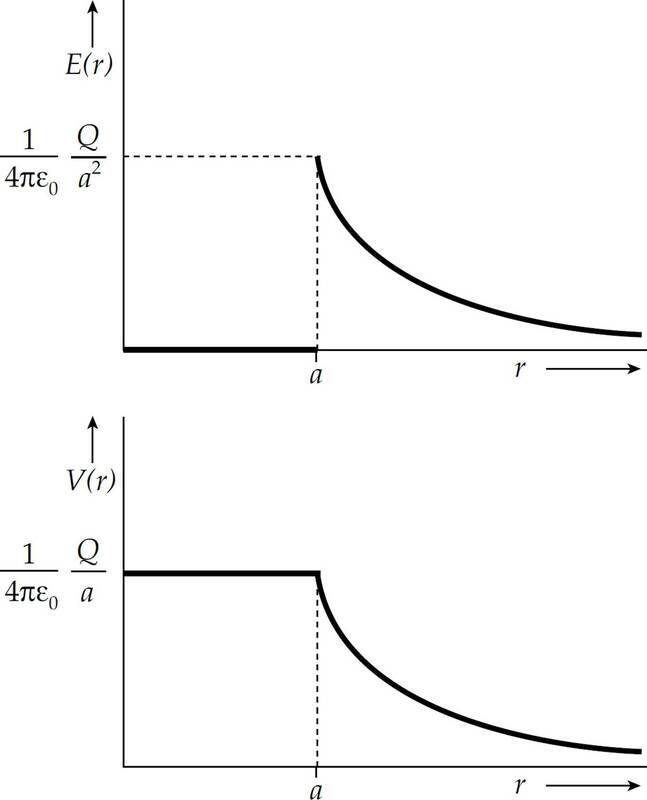 A Since Q cannot change and C is increased (because of the dielectric), V = Q/C must decrease. Also, since UE = Q2/(2C), an increase in C with no change in Q implies a decrease in UE. Note that neither the length of the segment AB nor that of the curved path from A to B is relevant. Capacitors 1 and 2 are in series, so their equivalent capacitance is C1-2 = C/2. (This is obtained from the equation 1/C1-2 = 1/C1 + 1/C2 = 1/C + 1/C = 2/C.) Capacitors 4 and 5 are also in series, so their equivalent capacitance is C4-5 = C/2. The capacitances C1-2, C3, and C4-5 are in parallel, so the overall equivalent capacitance is (C/2) + C+ (C/2) = 2C. 11. 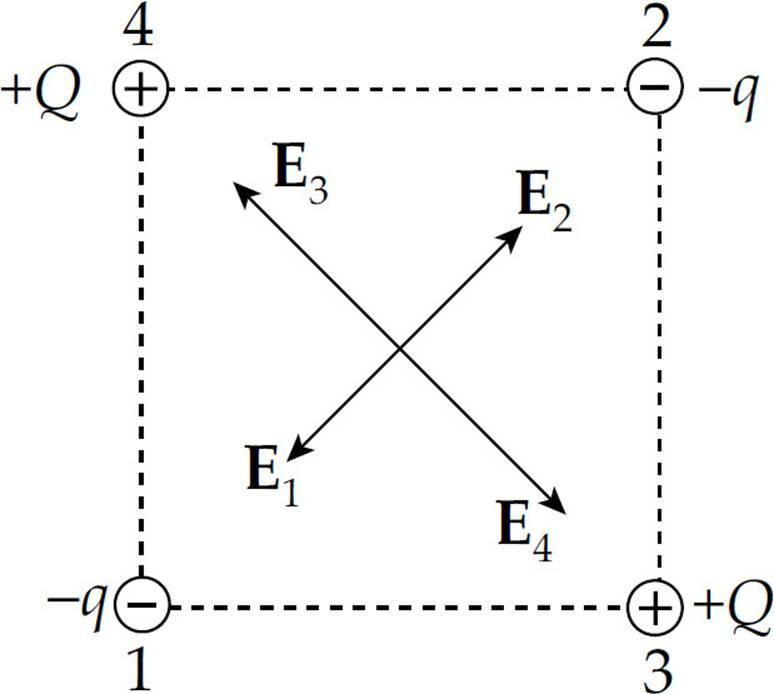 C Points A and E are on the same equipotential line, so no work is done by the field to move the electron from A to E. Electric fields go in the direction of decreasing potential, so the field associated with these equipotential lines is generally going to the left. 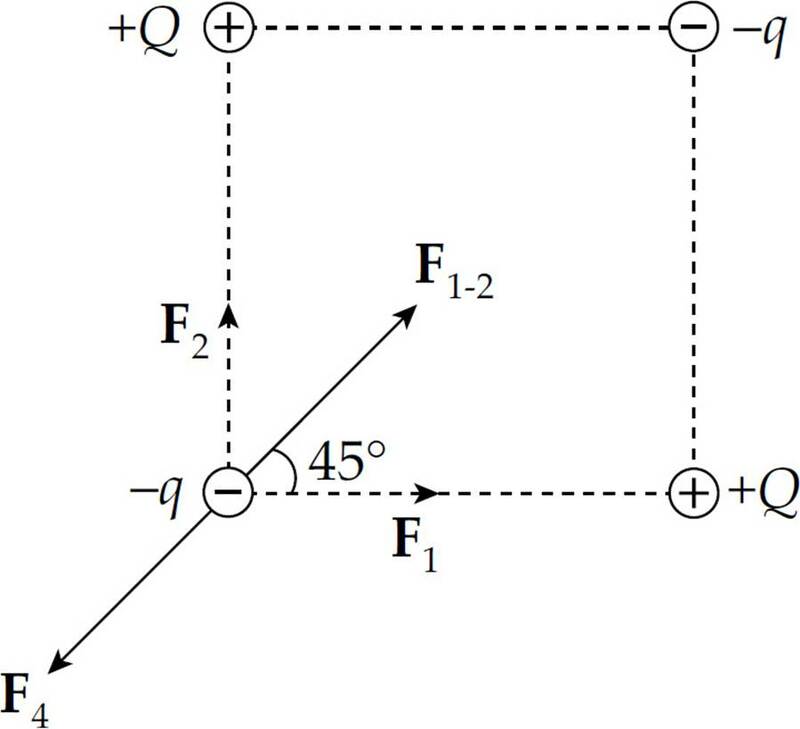 The field lines indicate the force on a positive test charge, so the force on an electron will be in the opposite direction. Therefore, the work done by the field on the electron is negative for the movement from E to C because the force on the electron is to the right and the movement is to the left. 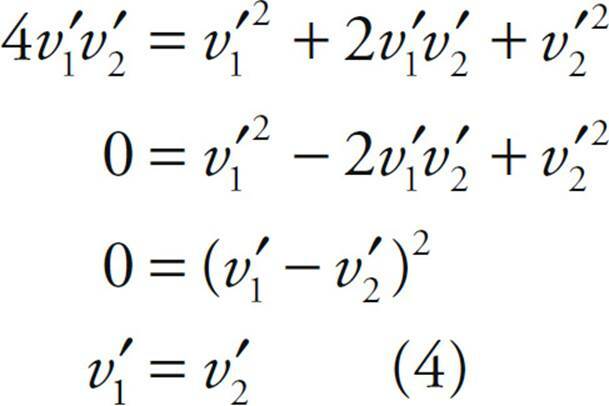 (e) The work done by the electric force as q is displaced from Point A to Point B is given by the equation WE = –q VA → B = –q(VB – VA) = –qVB (since VA = 0). 2. (a) The capacitance is C = ε0A/d. Since the plates are rectangular, the area A is equal to Lw, so C = ε0Lw/d. (b) and (c) Since the electron is attracted upward, the top plate must be the positive plate. 2. D The equation I = V/R implies that increasing V by a factor of 2 will cause I to increase by a factor of 2. 3. C Use the equation P = V 2/R. Therefore, the voltage drop across R is V = IR = (2 A)(15 Ω) = 30 V.
5. E The 12 Ω and 4 Ω resistors are in parallel and are equivalent to a single 3 Ω resistor, because 1/(12 Ω) + 1/(4 Ω) = 1/(3 Ω). This 3 Ω resistor is in series with the top 3 Ω resistor, giving an equivalent resistance in the top branch of 3 + 3 = 6 Ω. Finally, this 6 Ω resistor is in parallel with the bottom 3 Ω resistor, giving an overall equivalent resistance of 2 Ω, because 1/(6 Ω) + 1/(3 Ω) = 1/(2 Ω). 7. B The three parallel resistors are equivalent to a single 2 Ω resistor, because 1/(8 Ω) + 1/(4 Ω) + 1/(8 Ω) = 1/(2 Ω). 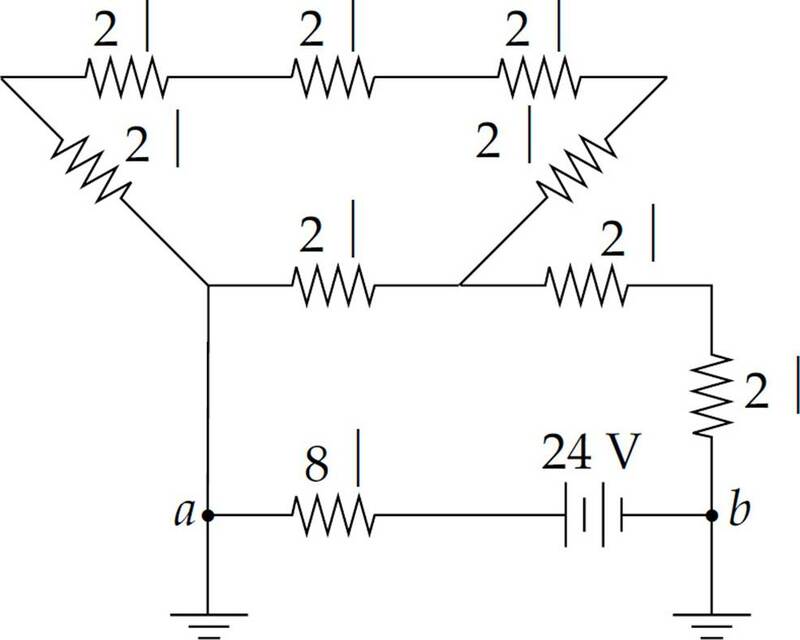 This 2 Ω resistance is in series with the given 2 Ω resistor, so their equivalent resistance is 2 + 2 = 4 Ω. Therefore, three times as much current will flow through this equivalent 4 Ω resistance in the top branch as through the parallel 12 Ω resistor in the bottom branch, which implies that the current through the bottom branch is 3 A, and the current through the top branch is 9 A. The voltage drop across the 12 Ω resistor is therefore V = IR = (3 A)(12 Ω) = 36 V.
8. E Since points a and b are grounded, they’re at the same potential (call it zero). Traveling from b to a across the battery, the potential increases by 24 V, so it must decrease by 24 V across the 8 Ω resistor as we reach point a. Thus, I = V/R = (24 V)/(8 Ω) = 3 A. 1. (a) The two parallel branches, the one containing the 40 Ω resistor and the other a total of 120 Ω, is equivalent to a single 30 Ω resistance. This 30 Ω resistance is in series with the three 10 Ω resistors, giving an overall equivalent circuit resistance of 10 + 10 + 30 + 10 = 60 Ω. Therefore, the current supplied by the battery is I = V/R = (120 V)/(60 Ω) = 2 A, so it must supply energy at a rate of P = IV = (2 A)(120 V) = 240 W.
(b) Since three times as much current will flow through the 20 Ω resistor as through the branch containing 120 Ω of resistance, the current through the 20 Ω resistor must be 0.5 A. (c) (i) Va – Vb = IR20 + IR100 = (0.5 A)(20 Ω) + (0.5 A)(100 Ω) = 60 V.
(ii) Point a is at the higher potential (current flows from high to low potential). 2. (a) The initial current, I0, is ε/r. (c) Because it is connected to the positive terminal of the battery, the top plate will become positively charged. (e) The current established by the discharging capacitor decreases exponentially according to the equation I(t) = I0e–t/τ = (ε/R)e–t/RC. Alternatively, simply notice that all the energy stored in the capacitor will be dissipated as heat by the resistor R. But from part (d), we know that the initial energy stored in the capacitor (before discharging) was Cε2. 1. D Statement I is false: The magnetic field lines, due to a current-carrying wire, encircle the wire in closed loops. Statement II is also false: Since the magnetic force is always perpendicular to the charged particle’s velocity vector, it cannot do work on the charged particle; therefore, it cannot change the particle’s kinetic energy. Statement III, however, is true: If the charged particle’s velocity is parallel (or antiparallel) to the magnetic field lines, then the particle will feel no magnetic force. 2. 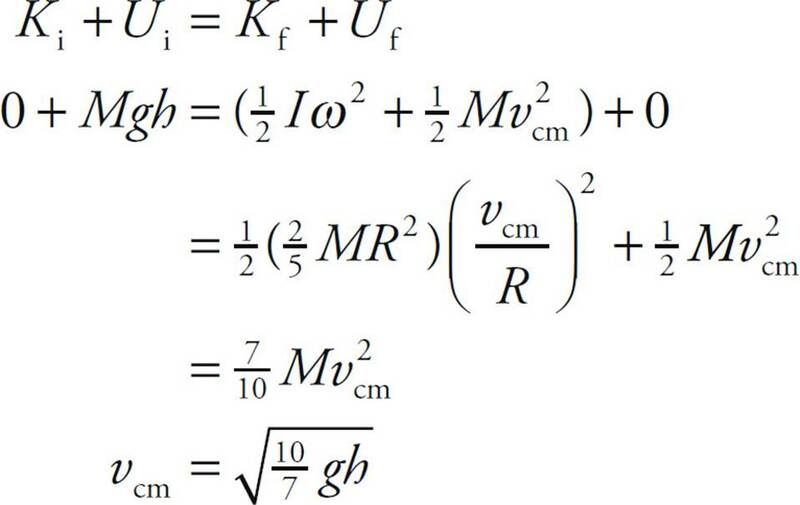 C The magnitude of the magnetic force is FB = qvB, so the acceleration of the particle has magnitude. 3. D By the right-hand rule, the direction of v × B is into the plane of the page. Since the particle carries a negative charge, the magnetic force it feels will be out of the page. 4. D Since FB is always perpendicular to v, v cannot be upward or downward in the plane of the page; this eliminates choices B and C. The velocity vector also cannot be to the right (choice A), since then v would be antiparallel to B, and FB would be zero. 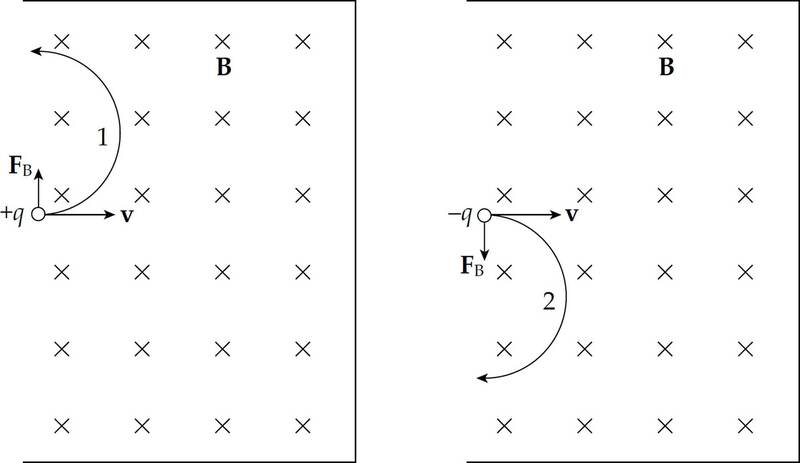 Because the charge is positive, the direction of FB will be the same as the direction of v× B. In order for v × B to be downward in the plane of the page, the right-hand rule implies that v must be out of the plane of the page. 8. 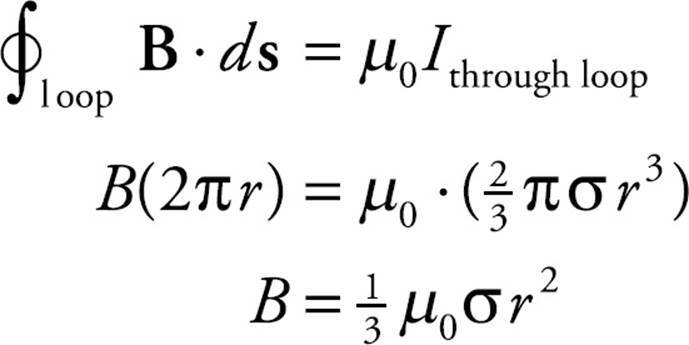 E The strength of the magnetic field at a distance r from a long, straight wire carrying a current I is given by the equation B = (µ0/2π)(I/r). 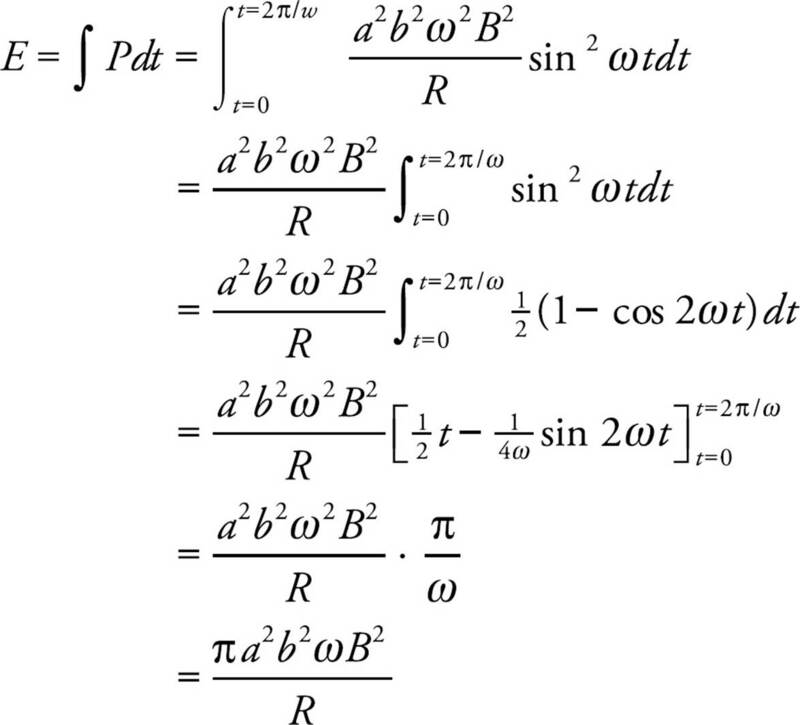 Therefore, the strength of the magnetic field at Point P due to either wire is B = (µ0/2π)(I/ d). By the right-hand rule, the direction of the magnetic field at P due to the top wire is into the plane of the page and the direction of the magnetic field at P due to the bottom wire is out of the plane of the page. Since the two magnetic field vectors at P have the same magnitude and opposite directions, the net magnetic field at Point P is zero. 1. 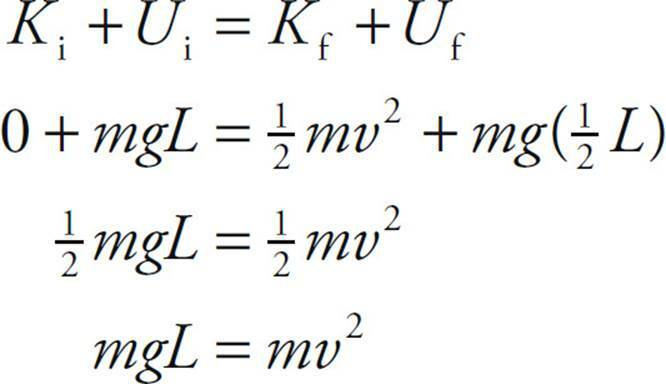 (a) The acceleration of an ion of charge q is equal to FE/m. 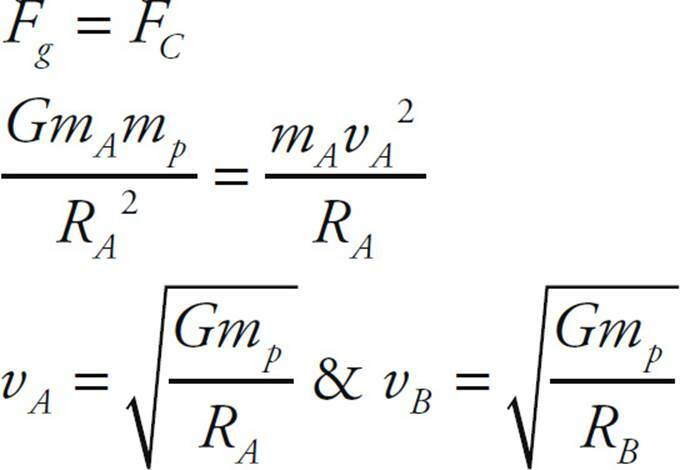 The electric force is equal to qE, where E = V/d. Therefore, a = qV/(dm). 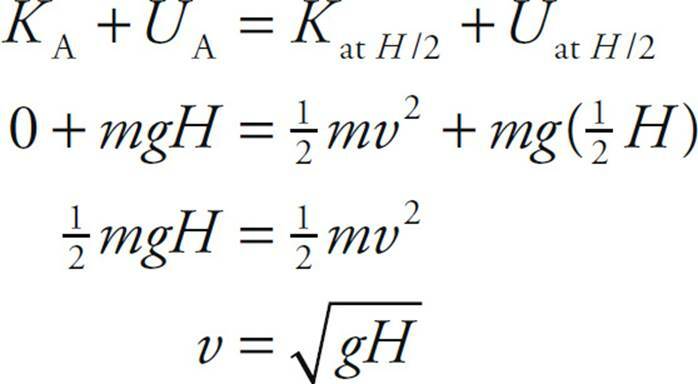 As an alternate solution, notice that the change in the electrical potential energy of the ion from the source S to the entrance to the magnetic-field region is equal to qV; this is equal to the gain in the particle’s kinetic energy. (c) (i) and (ii) Use the right-hand rule. Since v points to the right and B is into the plane of the page, the direction of v × B is upward. Therefore, the magnetic force on a positively charged particle (cation) will be upward, and the magnetic force on a negatively charged particle (anion) will be downward. The magnetic force provides the centripetal force that causes the ion to travel in a circular path. Therefore, a cation would follow Path 1 and an anion would follow Path 2. 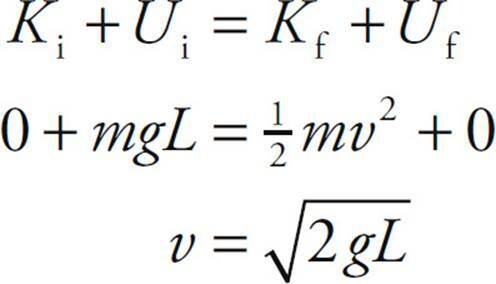 (f) Since the magnetic force FB is always perpendicular to a charged particle’s velocity vector v, it can do no work on the particle. Thus, the answer is zero. downward (toward the long wire). (d) If the long, straight wire passes through the center of the circular loop, then the magnetic field line of the straight wire would coincide with the current in the loop. Whether the current in the loop is parallel or antiparallel to the direction of the magnetic field line makes no difference; the magnetic force on the current-carrying loop would be zero (because ℓ × B would be 0). (b) If the charged particle is placed at rest at point C, then it would feel no magnetic force. Only particles that move through magnetic fields feel a magnetic force. (c) Since the current in the straight wire is antiparallel to the magnetic field at C, it will experience zero magnetic force (ℓ × B = 0). 4. 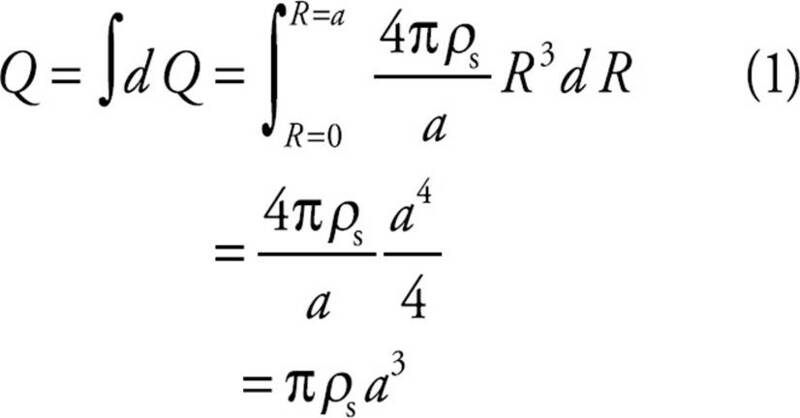 (a) The current in the rod is equal to the current density times the cross-sectional area of the rod: I = JA = J(πR2). which is certainly a familiar result! 1. E Since v is upward and B is out of the page, the direction of v × B is to the right. 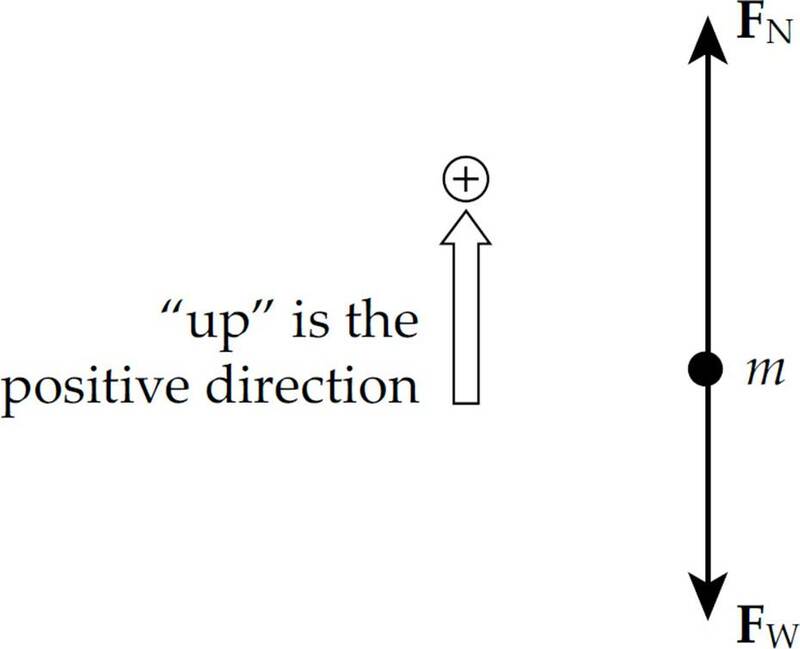 Therefore, free electrons in the wire will be pushed to the left, leaving an excess of positive charge at the right. Therefore, the potential at Point b will be higher than at Point a, by ε = vBL (motional emf). 3. 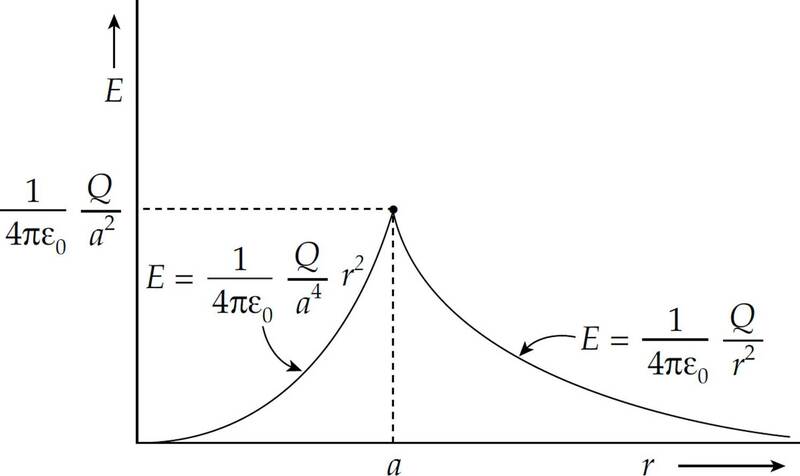 A As shown in Chapter 15, Example 3, the magnitude of the emf induced between the ends of the rod is ε = BLv = (0.5 T)(0.2 m)(3 m/s) = 0.3 V. Since the resistance is 10 Ω, the current induced will be I = V/R = (0.3 V)/(10 Ω) = 0.03 A. To determine the direction of the current, we can note that since positive charges in the rod are moving to the left and the magnetic field points into the plane of the page, the right-hand rule tells us that the magnetic force, qv × B, points downward. Since the resulting force on the positive charges in the rod is downward, so is the direction of the induced current. Since the magnetic flux into the page is decreasing, the direction of the induced current will be clockwise (opposing a decreasing into-the-page flux means that the induced current will create more into-the-page flux). 5. C By definition, magnetic field lines emerge from the north pole and enter at the south pole. Therefore, as the north pole is moved upward through the loop, the upward magnetic flux increases. 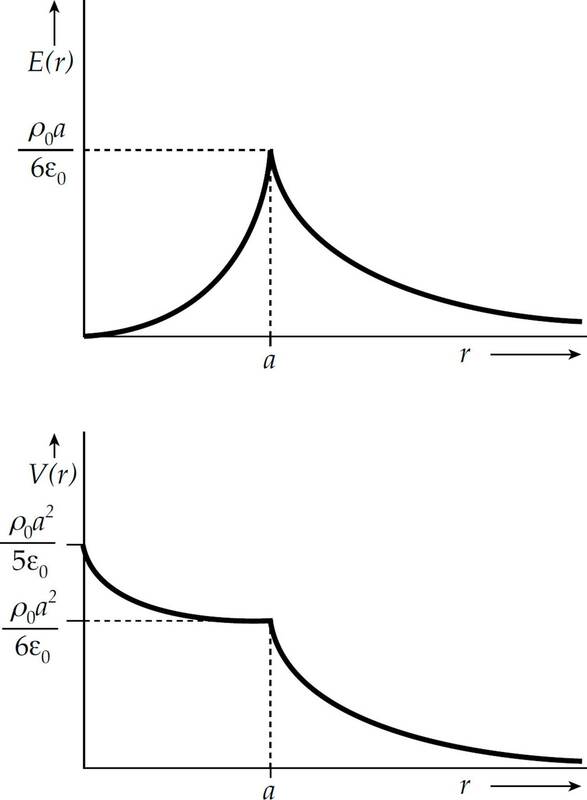 To oppose an increasing upward flux, the direction of the induced current will be clockwise (as seen from above) to generate some downward magnetic flux. Now, as the south pole moves away from the center of the loop, there is a decreasing upward magnetic flux, so the direction of the induced current will be counterclockwise. 6. E Since the current in the straight wire is steady, there is no change in the magnetic field, no change in magnetic flux, and, therefore, no induced emf or current. 10. 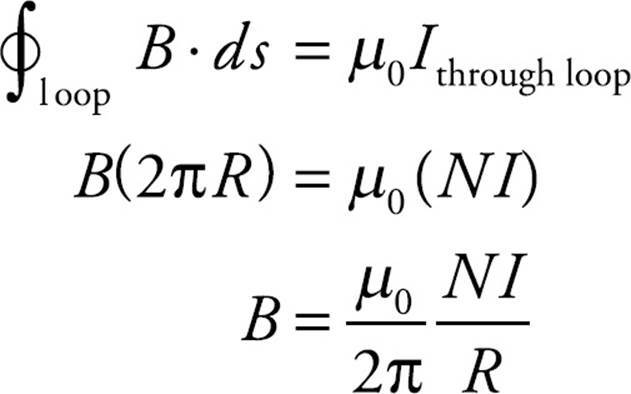 D Faraday’s Law shows how a changing B-field generates an E-field. 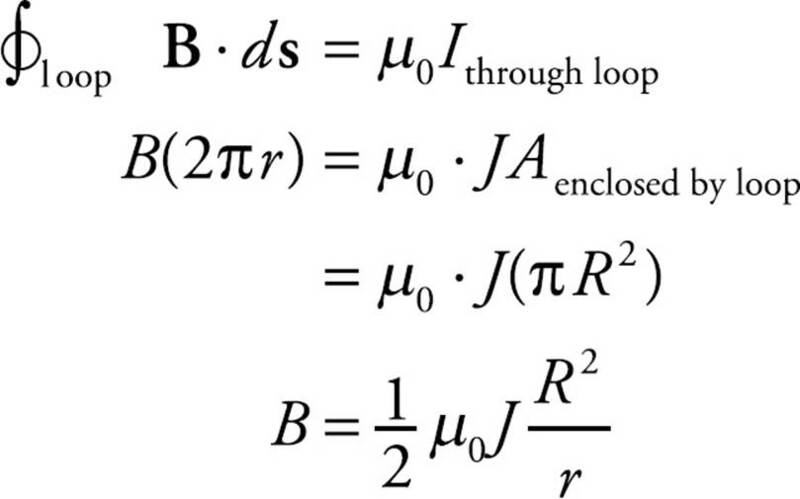 The Ampere-Maxwell Law shows the reverse: how a changing E-field generates a B-field. 1. 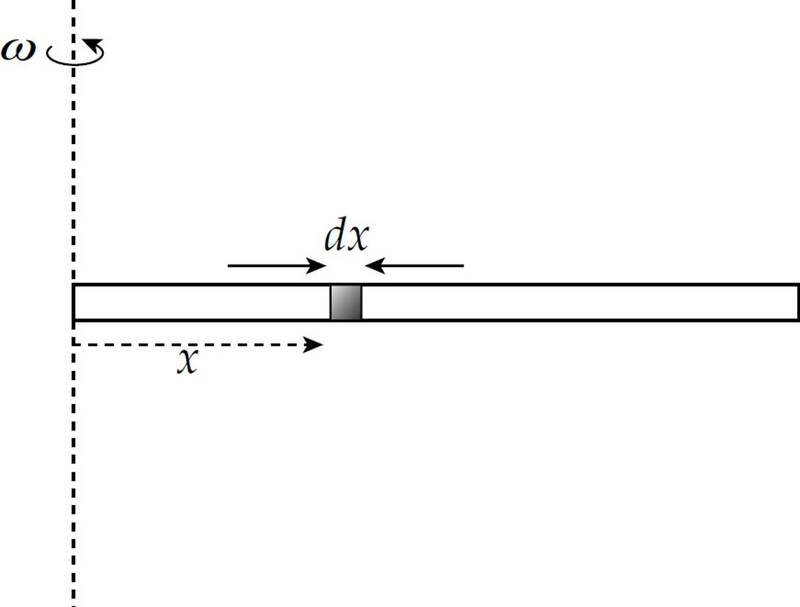 (a) Consider a small section of length dx of the rod at a distance x from the nonrotating end. By the right-hand rule, the direction of v × B is to the right, so the magnetic force on free electrons will be to the left, leaving excess positive charge at the right (rotating) end. (c) Consider a small section of length dy at a distance y from the straight wire. (d) The magnetic field above the wire (where the rod is sliding) is out of the plane of the page, so the direction of v × B is downward. Therefore, free electrons in the rod will be pushed upward to the far end of the rod, causing it to become negatively charged. (d) As the loop rotates from θ = 0 to θ = π/2, the magnetic flux (to the right, the +x direction) through the loop decreases from BA = abB to zero. 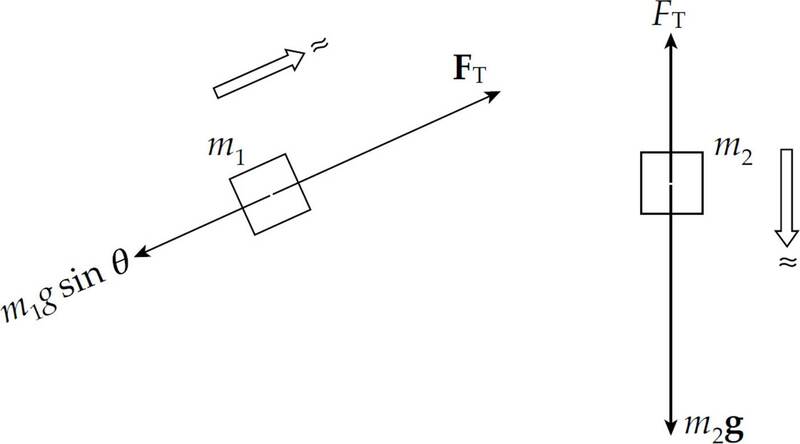 To oppose this decreasing flux to the right, the current will be induced in a direction to generate a magnetic field with a component in the +x direction. The current will be flowing from point 3 to 4 to 1 to 2 to 3. 4. (a) When the switch is initially moved, the inductor prevents an instantaneous change in current. So the current in the inductor, and the rest of the circuit, is zero. (b) After the steady state condition is reached, the inductor has no emf (since di/dt = 0) so the current in the circuit can be found using Ohm’s Law. (c) The current in the inductor does not change immediately, so the current in the inductor is 1 A.